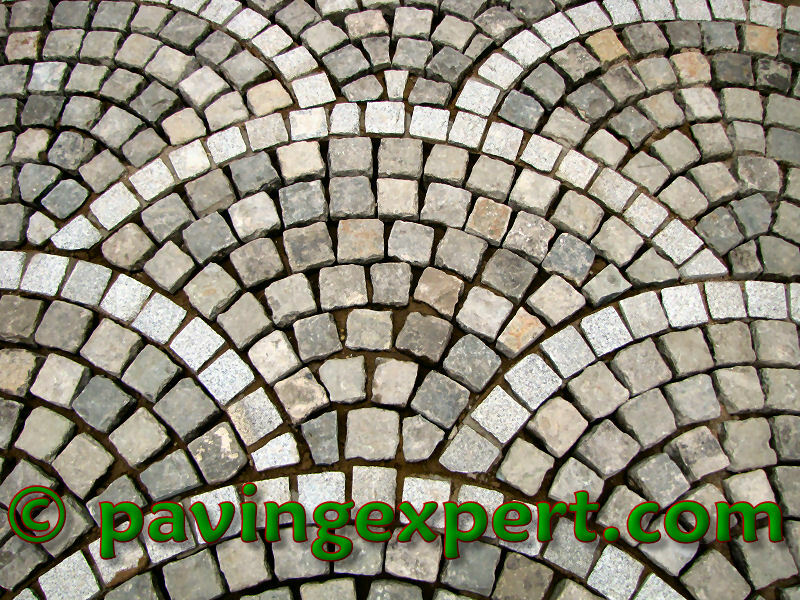 A blog for the pavingexpert.com website featuring the ramblings of Tony McCormack, updates from his travels around the world of paving, and comments on those areas of life that need settling down to a sensible level with a few gentle taps from the maul. It's hard to believe I haven't posted anything new since June, but then it has been a busy summer, and much of my time has been spent on photo- and video-shoots that will provide new content for the website over the calmer winter months. 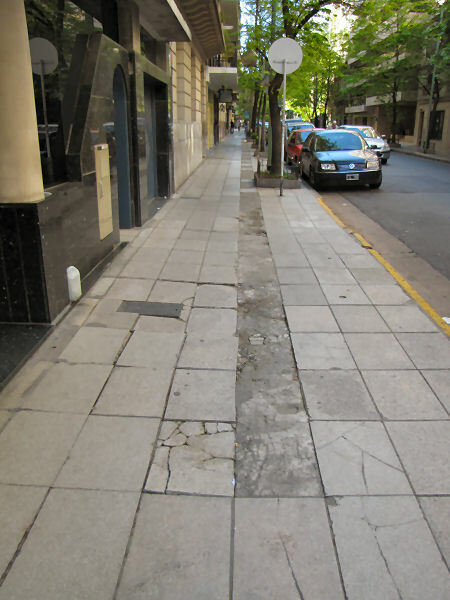 There’s been a fair bit of travelling over the past couple of months, so I thought I’d share some ‘holiday snaps’ that might be of interest to paving fans, starting with the comedy pavements of Buenos Aires, as observed during the International Conference on Concrete Block Paving. The paving of choice in the more salubrious parts of the city are these silver grey 450x450mm flags with a ‘chocolate block’ finish. 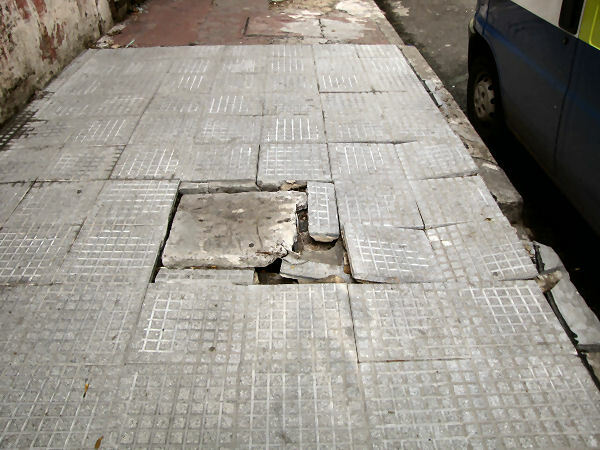 This type of paving is popular in many Latin countries for reasons that escape me completely. I’ve heard arguments about enhanced drainage, enhanced traction, and even enhanced aesthetics, none of which convince, but then it would be a boring world if we all used exactly the same paving. 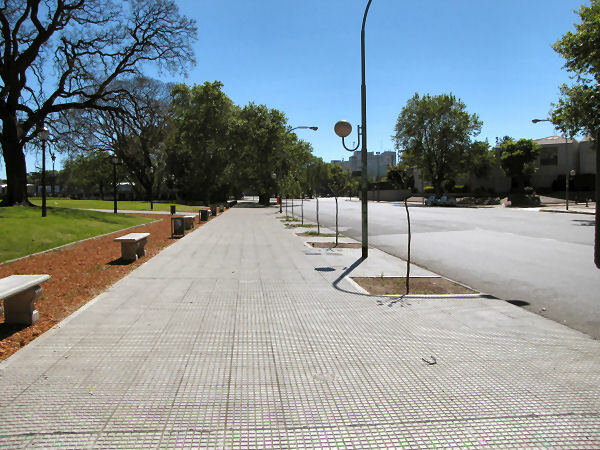 Putting aside the choice of paving, the actual construction and maintenance are often what determines how successful it is as a choice of surfacing and while there are some areas of the city that are well-laid and well-maintained, there are many areas where the standards of workmanship leave something to be desired. This is the edge of the new paving, where it meets the old setts. I think it would be fair to say that finishing-off is not their strong point. The next time I visit the city (if there is a next time! ), will someone please remind me to take a straightedge with me? I reckon I could make a fortune selling them to the Highways’ Department. 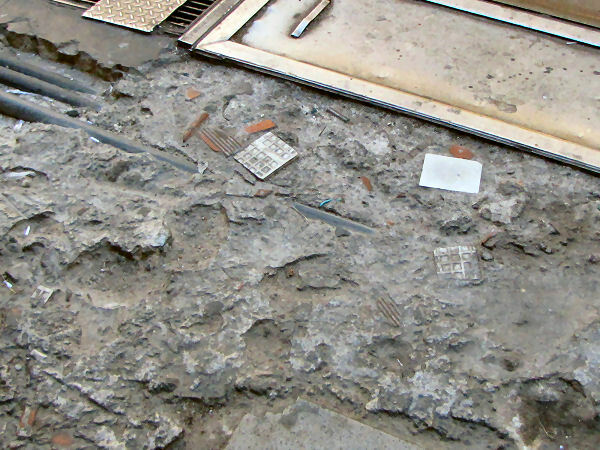 Setts are not the only natural stone paving on display around the Cementaria. Outside the Chapel, they’ve re-laid the “flagstones” (and I use that term in the widest possible sense). There’s a wide range of native stone on display, along with some other ‘rocks’ that seem to have been found…. 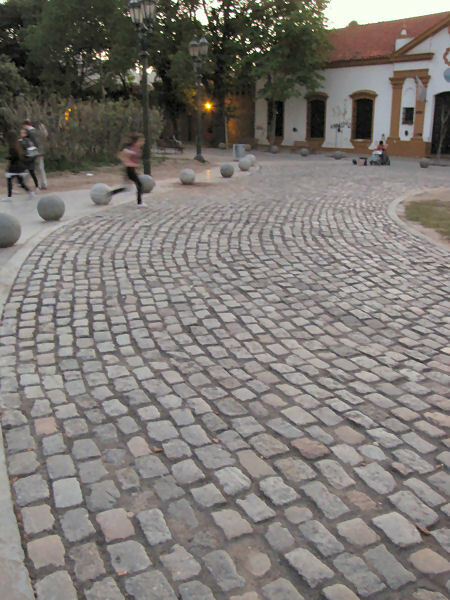 The reddish-purple stone is Porphyry, one of the native rocks for which Argentina is renowned, second only to Italy in terms of supply of this lovely paving material, and in some of the more upmarket areas of the city, the stone has been laid in its more usual format: cubes…. …that looks grand, doesn’t it? 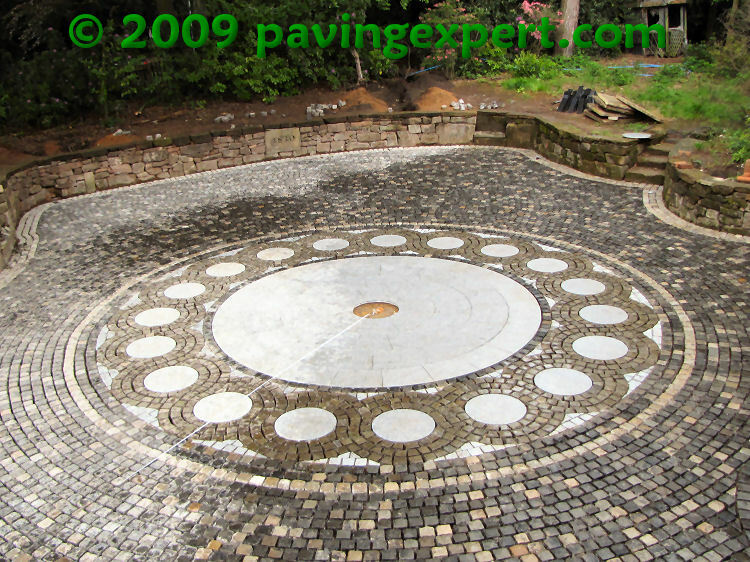 Porphyry setts laid as a fan pattern. The levels look fine, and there’s even an edge course, but wait a minute: those fans – there’s summat not quite right. When you look more carefully, it becomes apparent that the fans run out after a couple of metres or so and the ‘pattern’ (if I can use that term) degenerates into a sort of fan/bogen/arc mish-mash. It seems the installer started off with the general idea of laying fans but got lost or went dizzy after a an hour or two and just started dropping setts in wherever they went as long as it was vaguely arc-like and not a straight line. 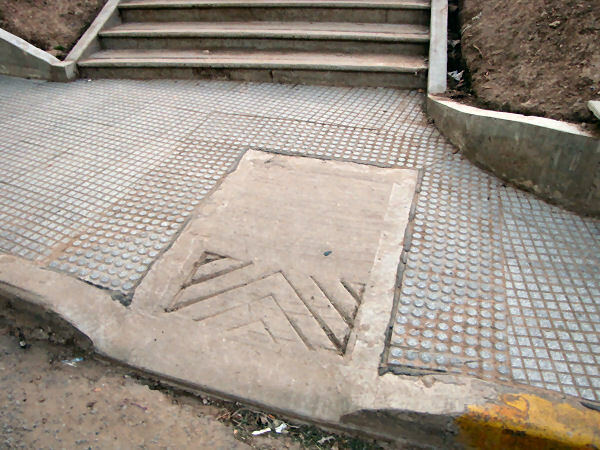 …but the concept of using recess tray covers to maintain the pattern and so mask the presence of a bloody great manhole seems to have been too much to expect! 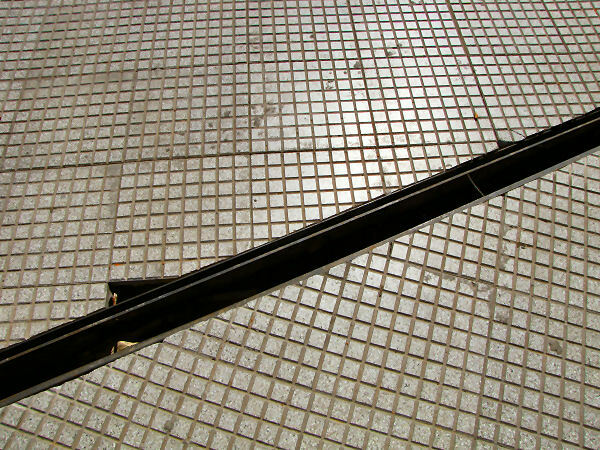 …yes: that’s a 150mm wide and 300mm deep polymer concrete linear channel, but either the local Knackers have availed themselves of the gratings as part of their weigh-in at the local scrap metal yard, or the pavement crew haven’t realised that there are gratings available to prevent the good citizens of Buenos Aires snapping their ankles when darting across the pavement from the Sheraton to the train station. 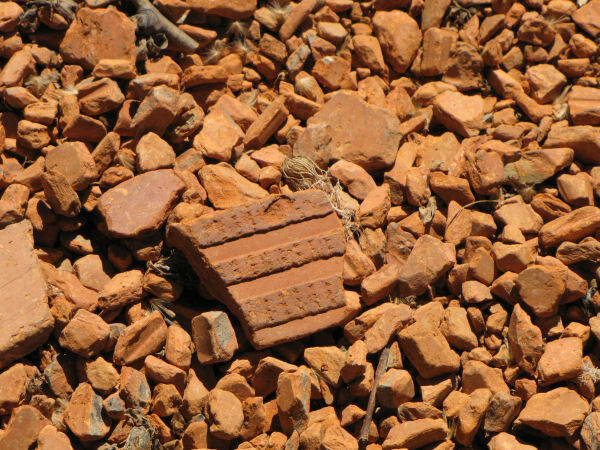 ...crushed terracotta! How good is that? …there’s absolutely no danger then, is there? And if you do have to dig a trench to contain the utilities, there’s no need to go made and bury them, ooh, tens of centimetres deep. It only makes them harder to find…. …if they are kept close to (or at) the surface, then there’s no need to waste money on those expensive CAT machines. Besides, if the services happen to be located right outside an expensive up-market car dealership, all the fancy electronic in those imported motors would probably lead to false readings. 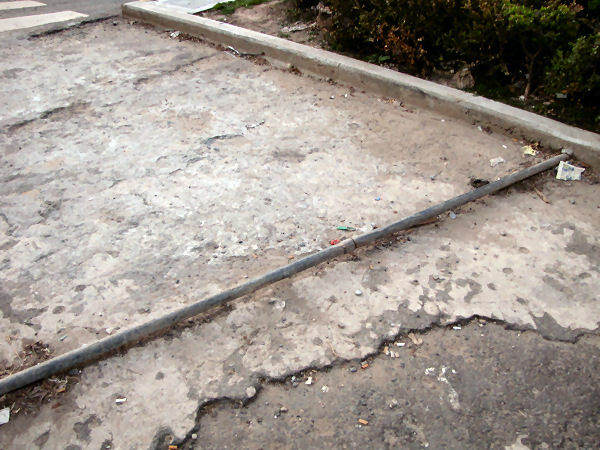 Just lay the cables in the trench and cover them over with a barrowful of quality concrete…..
…but remember not to smooth-out the concrete too much or it might become slippery. A textured surface offers extra traction for both pedestrians and vehicles. 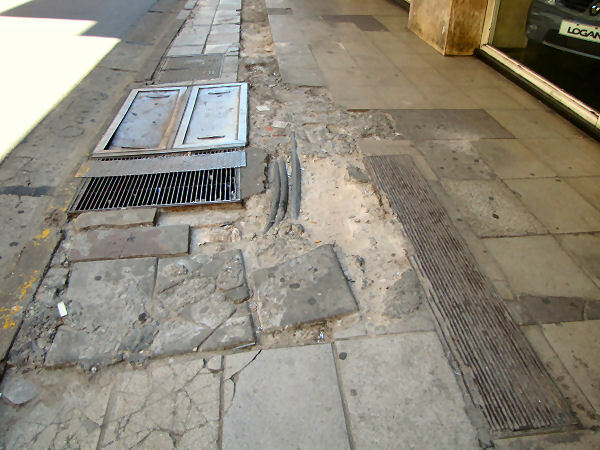 …if you’re still not sure, it’s more or less smack-bang in the centre of the footpath. 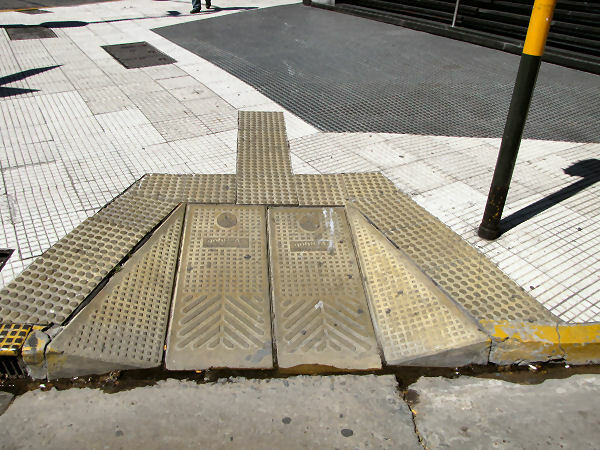 … it might not be the prettiest of dropped crossings, but it does have a form of blister paving a round the perimeter to alert the visually impaired of its presence. Not much of a contrast though, is there. What if they used a different colour for the blister tactiles? They could use a subtle shade of buff, as they do in that Europe…. 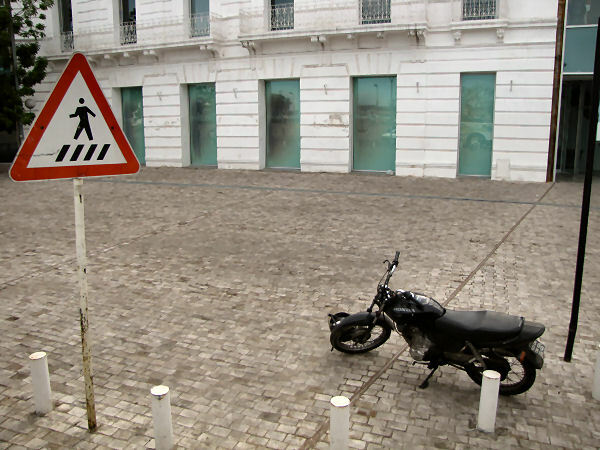 Actually, it’s easy to take the piss out of the paving in any city. There’s a real shocker of a tumbled CBP corner in my home town of Warrington, and we’ve all seen iffy pavements in London, Dublin, Cardiff and Edinburgh (don’t mention the Royal Mile! 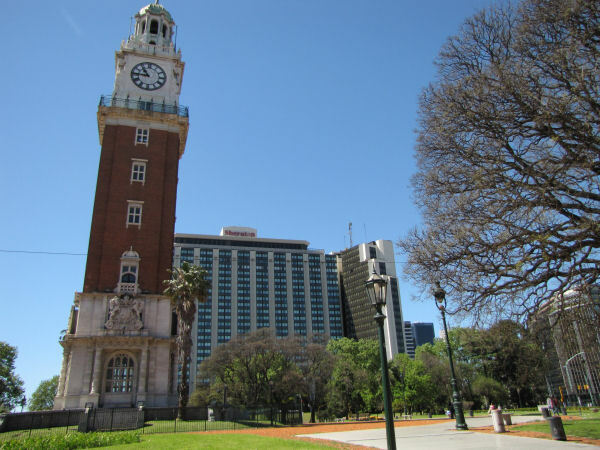 ), so if I’ve been harsh on Buenos Aires, then I’ll finish on a positive note. Wooden block pavers. They were used in that London in the 1840s in an attempt to reduce road noise from horse’s hooves, and while these are long gone, there are still some on show at the entrance to Trinity College at College Green in Dublin, but the largest expanse of new wood pavers I’ve ever seen is to be found in dockside La Boca, Buenos Aires…. 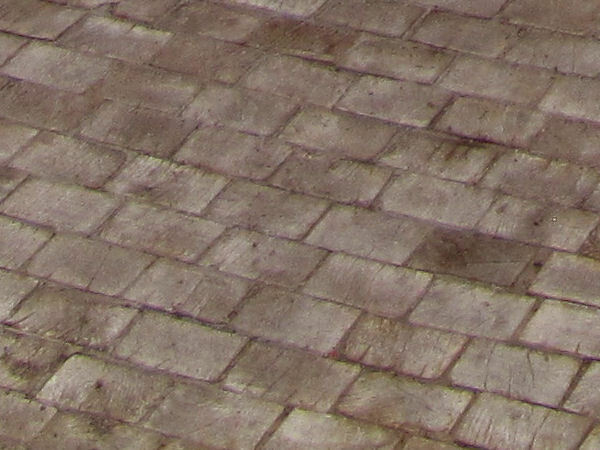 … they might look like a dirty light brown stone or concrete paver in the photie above, but they definitely *are* wooden blocks. Unfortunately, I was on an open-top tourist bus when I spotted them, so the best close-up I can manage to prove my point is…. Ten weeks and one day after starting the sett paving project at The Old Croft in Knutsford, the very last sett was laid, and now the jointing, which will take around 3 or 4 days, begins. 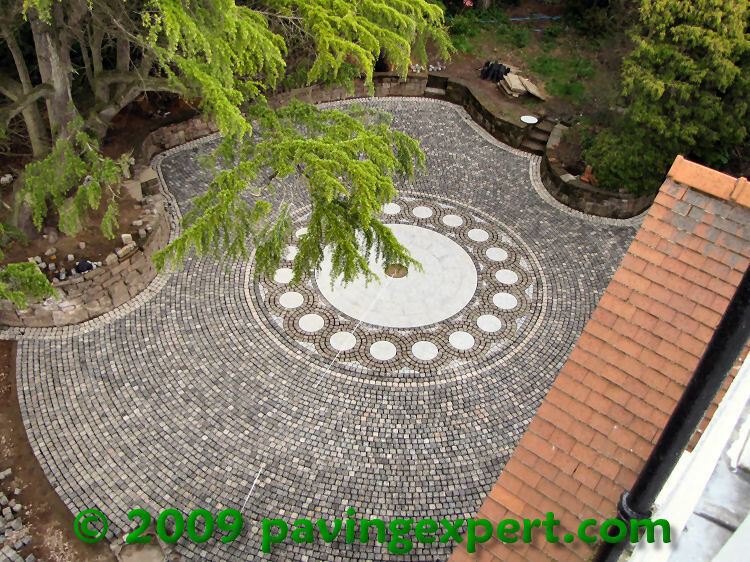 Four different sett patterns have been used over the nearly 500m² of paving: guilloche, radial, transverse broken bond and fans each make a contribution to the overall design, showing off the best in craftsmanship as well as bringing out the best in the stone, not to mention the stunning property itself. Choosing the jointing was a tricky decision. The sheer cost of the project to date, including the money paid for the aborted first attempt by the Cheshire Cowboy Crew, urge caution when it comes to jointing, and there’s not much that is cheaper than a sand/cement slurry. However, such an option would cost far more in terms of labour, and then there’s the lengthy post-jointing cleaning process that is never 100% successful when working with cement products. Resin mortars are significantly faster to apply, and have the advantage of leaving the pavement surface in pristine condition with no stains or blemishes, but they ain’t particularly cheap. However, it seems silly to spoil the ship for a ha’p’orth of tar at this stage, so it was decided, through gritted teeth (and mixed metaphors), to bite the bullet and go with the resin mortar. After a lengthy discussion, UK supplier of Romex mortars, McMonagle Stone, came up with a fair price for the several tonnes of mortar that would be needed to fill the gaps between all those setts (Cookie from The Original Stone Paving Co. reckons there’s close on 48,000 of the buggers!). The sett laying at Knutsford has today just passed the widest point, and from hereon, the drive narrows down to around 3.6m, so progress towards the main entrance will seem incredibly fast after today. Another couple of weeks or thereabouts, and the whole of the front driveway should be complete. The fan pattern layout has really come into its own since they have 'spread out' over the widest section which shows off this pattern to its best effect. This latest photo shows the progress albeit without the paving to the recess tray (heavy duty 750x750 covers supplied by Clark Drain) being completed, but the tray was only installed this morning, so needs 24 hours to allow the bedding mortar to harden before it's loaded with all those setts. On the subject of ironwork, the cast iron gratings to the Aco Channel Drain have now been fitted to the channel installed at the curving boundary between the circular layout setts and the fan pattern. We're really pleased with these, as the simple iron grating suits both the property and the sett paving. You'd swear they'd been there since the house was built, and by allowing them to follow the curve, they seem such a natural break between the two layouts. Work continues apace to the job at The Old Croft in Knutsford and the last week has seen the start of the fan pattern laying. 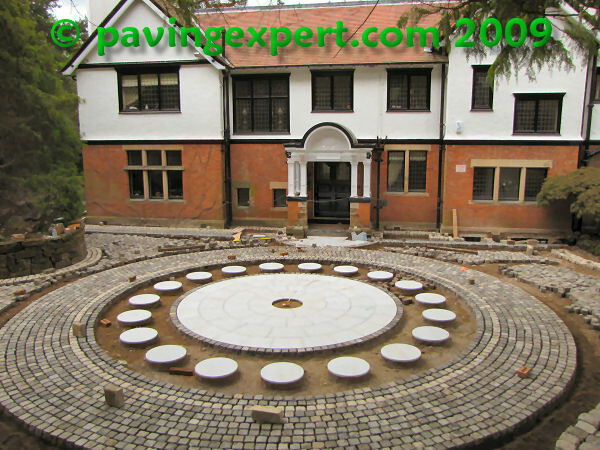 All of the circle work is complete, the recess trays have been fitted and the joints prepared for final filling with the resin mortar any day now. Cookie, proprietor and chief sett layer for The Original Stone Paving Company who are constructing the paving, prefers to use a steel frame to guide accurate laying and alignment of the fans, but due to the special nature of this job, and the fact that reclaimed setts are being used, the standard fan frame wasn't quite right, so we had to have a new frame assembly fabricated to order and that arrived on site last Monday. You can just make out the frame in the photo above. 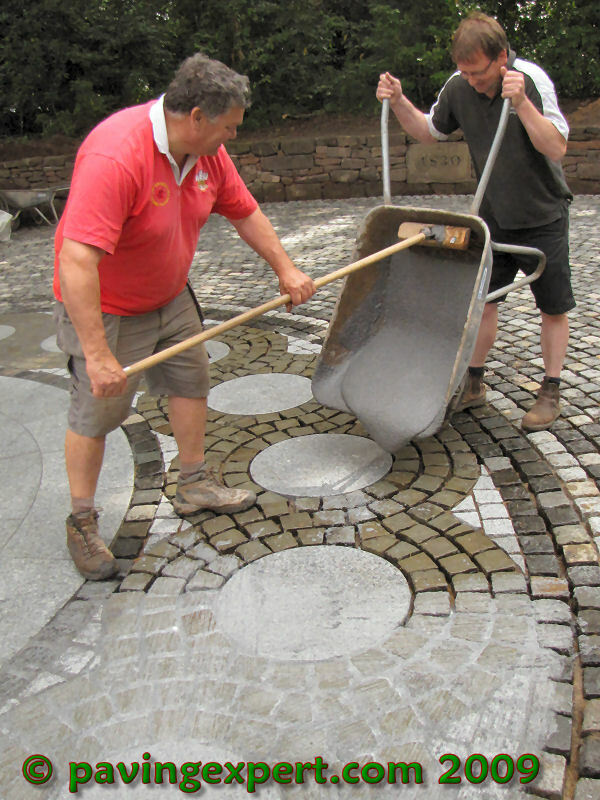 The full assembly comprises a number of individual 'fans' that are bolted together to ensure accuracy, and then set to level to guide precise position and levelling of the setts as they are laid inside each 'frame'. There are almost as many methods for laying sett fans as there are tradesmen capable of doing the job properly, but this, for me, is the simplest, speediest and least problematical method. 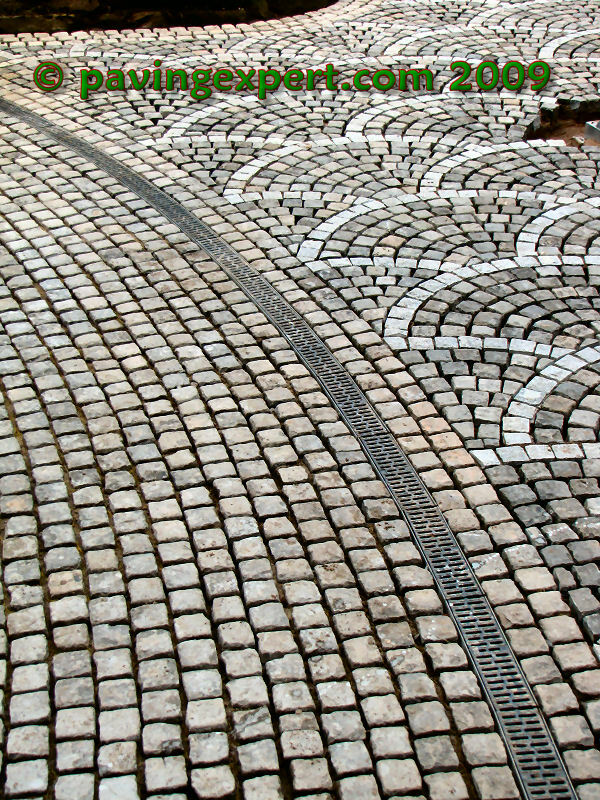 As can be seen in this close-up shot of a single fan, the number of cut setts is kept to an absolute minimum - we reckon on 6-8 per fan, and these are predominantly simple trimming cuts rather than full dressing cuts, so speed of laying is maintained as far as is practicable. Also note how the outermost course of each fan has been laid using a lighter-coloured sett. 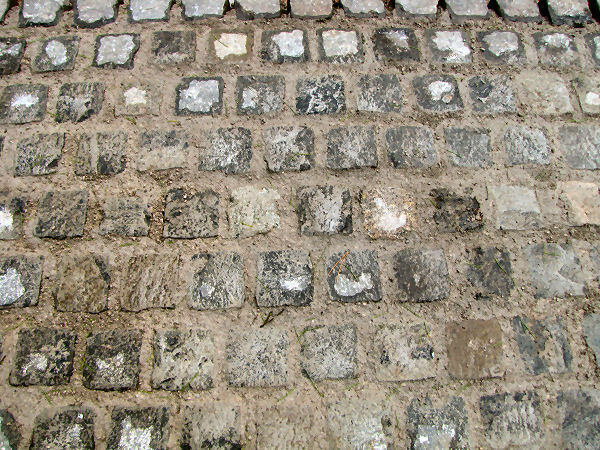 These are new white-grey Egyptian Granite setts, with a basic cropped texture but as there is only the once course per fan, that won't impede traffickability for pedestrians too greatly. What it does do, however, is gently emphasise each fan as an individual. And the effect is, just as you'd expect on this job, truly stunning. In this photo, the setts have just been dampened down. in the very hot weather that we were enjoying when this section was laid, the pre-mixed bedding mortar can dry out too rapidly, so every hour or so during the heat of the day, the whole area is hosed down to aid proper curing of the bedding mortar, and it helps bring out the natural beautiful colours of the reclaimed setts. I'm overwhelmed by the response there's been to this project. It's immensely reassuring to hear from other tradesmen, streetmasons and other crafts alike, expressing their admiration for what we're doing with this project in leafy Knutsford. And so to show how much those supportive messages, and the requests for more piccies are appreciated, we sent Cookie from The Original Stone Paving Company, all umpteen stone of him, up onto the very top of the roof with a Box Brownie to get some photies of the now complete guilloche from on high. 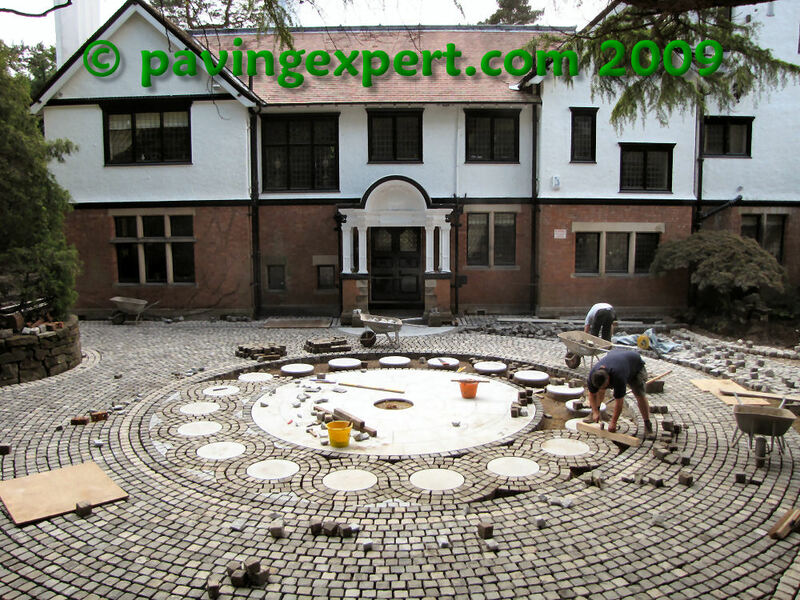 The circular paving is almost complete - in fact, it probably is complete given that I left the site before 2pm - and Cookie reckons he'll start laying the Fan pattern to the main driveway tomorrow. The other development since the weekend is the panels for trialling the jointing material. Basically, a 1m x 3m panel of the reclaimed setts has been jointed using three different colours of resin bound mortar, allowing the client who wouldn't be overly familiar with this type of product to choose which he prefers. I went for the darkest option, as did Cookie, and most of the lads working with him. The client's sister also preferred the darkest colour, so it was a cast-iron inevitability that the client would choose the lightest of the three! We'll see......! Due to Cookie's forthcoming nuptials and the associated revelry that tradition dictates must take place beforehand, himself and Sean turned in this weekend to complete the laying of the intricate guilloche in the centre of the driveway, with me watching on and trying not to hinder them too much. 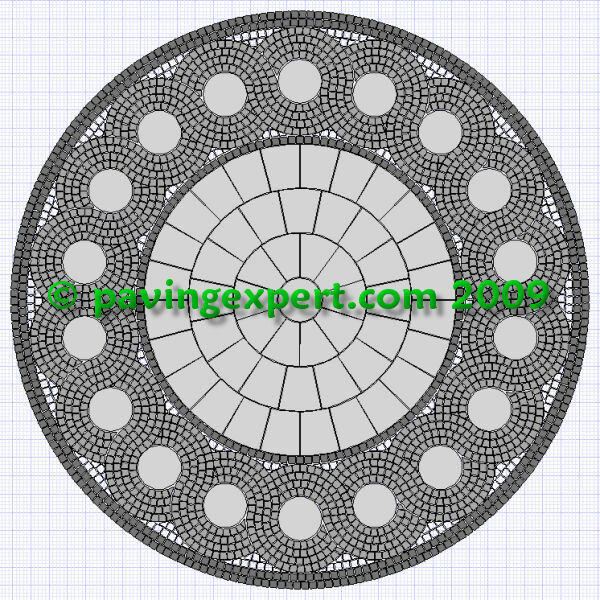 As mentioned previously, the centre of the feature is a 5m diameter silver-grey granite circle custom-cut and supplied by McMonagle Stone in Ireland (even when haulage is added on, they are considerably cheaper than any of the UK suppliers). 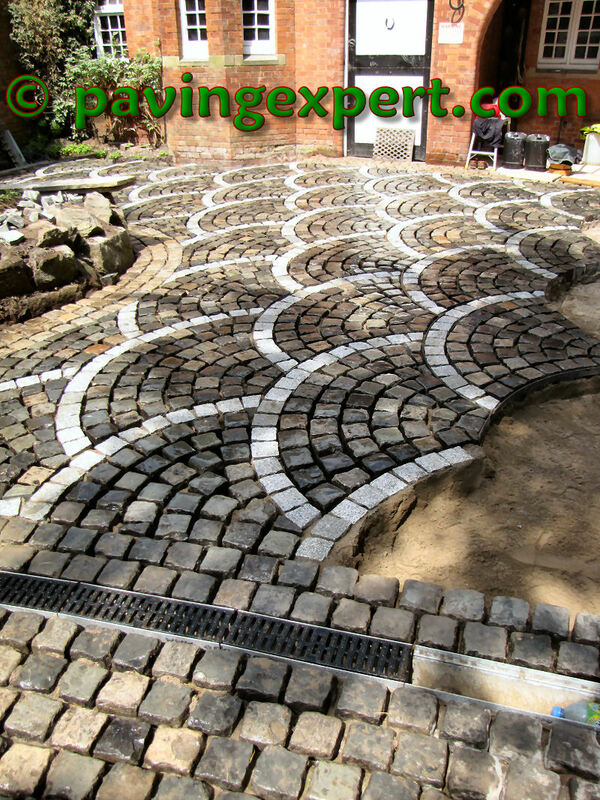 The outer bands are dark basalt setts originally from North Wales but salvaged from a disused tram shed in a neighbouring town. 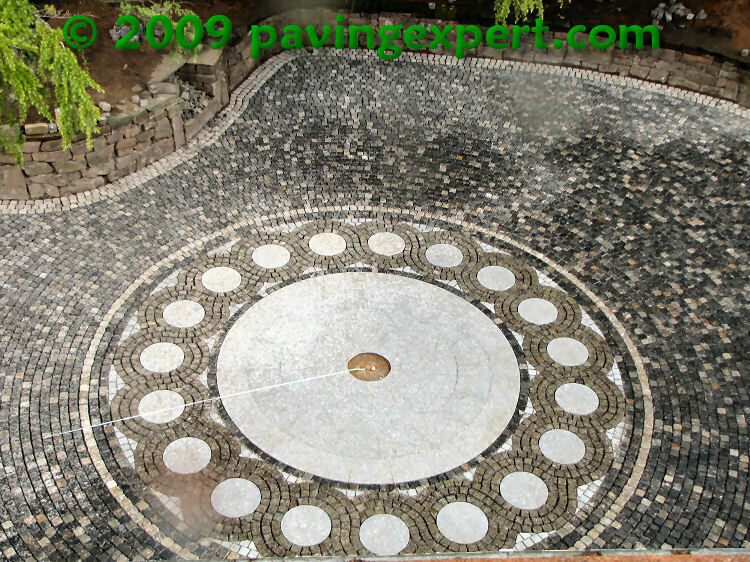 The guilloche itself has been formed using the sandstone setts salvaged from the original driveway, and the whole is surrounded by a double course of silvery "Tan Tops", a Cornish granite sourced from a reclamation yard. The infill pieces are a silver Egyptian granite used to give us additional contrast. The sandstone setts look slightly green because it rained while the paving was being laid and the moisture highlighted the residual algae, which will come off when the whole pavement is cleaned prior to jointing. The sandstone itself is definitely pennine and I was fairly certain it was the Kerridge stone from near Macclesfiled, which is just 10 or so miles down the road, but there are definite blue and grey tones evident when the stone is cut to form those double taper-cut wedge shapes and this makes me wonder whether they might actually hail from further north, possible the Rossendale Valley. So: the photo above was the scene late on Saturday afternoon with Cookie in the foreground laying the sandstone setts and Sean just behind him fettling some of the Egyptian granite. In a frenetic nine-hour shift, with just an hour for a barbecue lunch kindly provided by the client, just over half of the guilloche was completed. ..and this is how it stood when I had to leave the site at 1:30pm on Sunday (today). All of the sandstone setts are laid and Sean is fitting the Egyptian granite infill pieces. There's perhaps another 90 minutes work to complete the feature but even at this stage, and with the surface still being slightly damp, it's possible to see just what a fabulous feature this has become, thanks to a meticulous design and some excellent laying from The Original Stone Paving Company. ...not what you might call quality work, and to make matters worse, the paving had been laid to a level that was 150mm ABOVE the damp proof course! My advice was to part company (I didn't use quite those words) with this alleged contractor, and I'd put him in touch with two or three genuinely skilled and experienced sett layers who would be able to salvage something from the disaster that was now despoiling his home. It's no exaggeration to say that he was close to tears at the stress and financial cost he'd borne for over three months while the eejits managed to ruin a little over 150m² of sett paving. 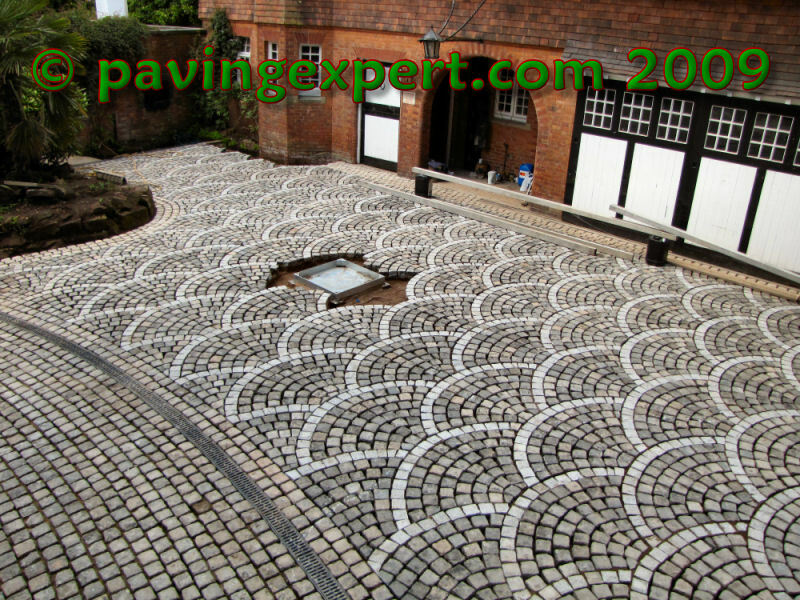 He asked me to design a new driveway, and to get prices from genuine contractors to rip up what had been laid, and re-lay to a professional standard and with a bit of flair. After a long discussion about what he liked, and what he felt suited the property, I came up with a layout that he immediately loved. 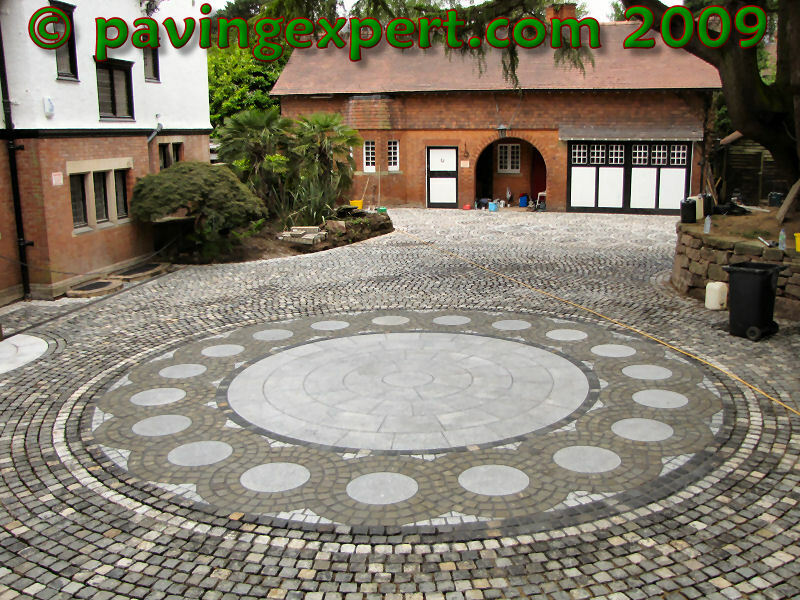 Based on a stunning circular guilloche feature centred on the front doors of the property, the Mark II driveway would use a circle layout for the frontage and a fan pattern for the driveway. Obviously, good sett layers are few and far between, but we put the job out to tender and the job was eventually awarded to Cookie and his crew from The Original Stone Paving Company from Wrexham. They started work just after Easter and the first task was to get rid of the pig's ear that the original gang still believed to be a good job. Three weeks into the job and all the old crap has gone. The ground level has been reduced so that the paving will be at least 150mm below DPC; the drains have been checked and cleaned of all the muck that had been allowed to fall into uncovered manholes by the previous crew, and sett laying has started in earnest. 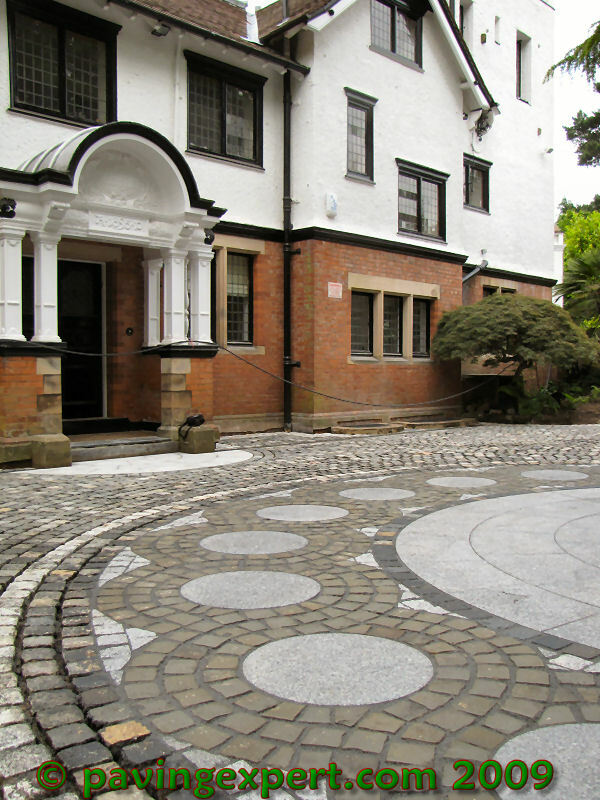 The central flagstones for the guilloche feature were custom cut for this job by McMonagle Stone to create the exact diameter required, and they also provided the smaller 'dots' around which the setts will revolve. Now we're beginning to see the project take shape, so here's the first of what will, hopefully, be a series of photies following the job as it progresses. Jobs like this don't come along very often, and it's a real treat to be involved in a project that will restore a property to its true former glory, using original materials as far as possible, and celebrating the skills of a genuine streetmason. I'm uncertain whether or not it's considered polite to plug your own website in a blog, but what have I got to lose? Taking advantage of the Bank Holiday in England combined with the fact that a "even-more-painful-than-normal" back prevented me making good around the new patio in the garden, I had to fall back on my indoor interest to while away the day. I've loved comics since I was old enough to read. I'm convinced that my severely dyslexic son wouldn't be able to read today if it were not for The Beano which encouraged him when teachers, John & Janet, and a small library of Ladybird Books had failed. So, the opportunity to combine two passions (paving and comics) in one web page seemed to be the perfect way to gainfully use an hour on an otherwise quiet afternoon. 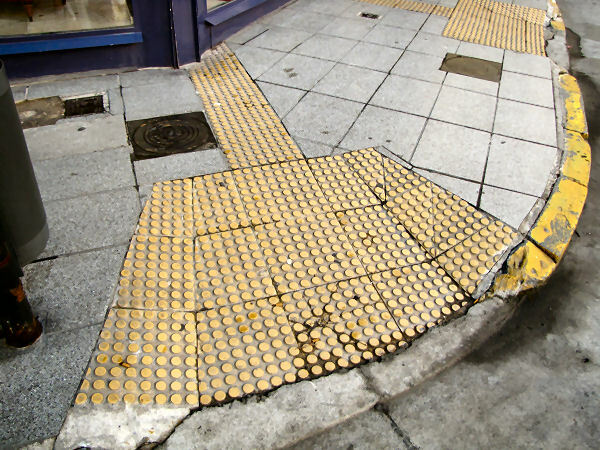 You didn't know paving had featured in the comics? Well, take a look at this! Latest on the super circle - a web page detailing the installation is now complete and online for your education and entertainment. See DTp1 being laid as a sub-base. Witness the laying course balls-up! Be the first to be wowed by the new Stonemarket underwear-inspired paving! 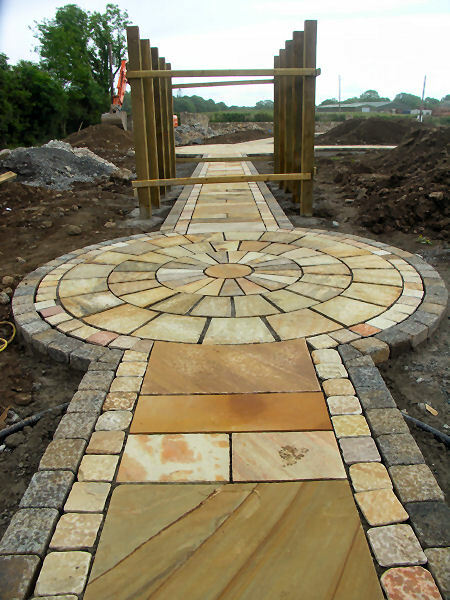 Jointed the Stonemarket Celtic Knot circle this morning, again relying on Ken and Craig from KGC Paving to do the physical work while I supervised and took photies. We used the Rompox Drain, supplied by McMonagle Stone, and the whole thing was jointed and cleaned off in around 15 minutes: 5 to joint; 5 to dry; and 5 to sweep off, and that was stretching it, to be honest. Looks better than ever, especially in the lovely warm sunshine we've enjoyed this week, and now I just need to get the rest of the garden sorted out! 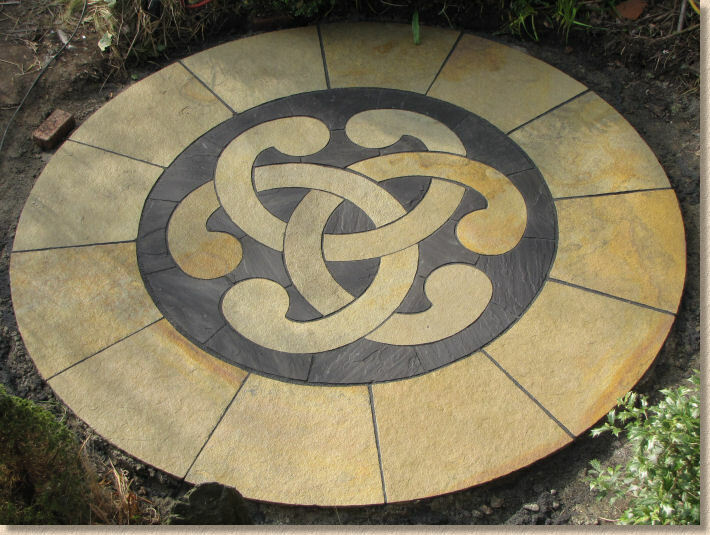 Since first clapping eyes on it at Glee last September, the Stonemarket Celtic Knot has totally entranced me, and I've been lucky enough to have one installed in the back garden at Borlochs Hall. Obviously, my flag laying days are more or less over, so I was lucky enough to get Ken and Craig from KGC Paving to give me a day. It was a bit of a slog, but they managed to get it laid just before dark on St. Pat's Day, which seems an appropriate date for laying a Celtic Knot. It's still to be jointed, and the garden needs putting back into order, but for now, how bloody gorgeous is this.....? It's been a while, but now the weather is bucking up, my peripatetic meanderings start once again, and first 'Day Out' of the year takes place courtesy of Messrs Brett and their site at Barrow-on-Soar in Leicestershire. There’s little in life more satisfying than watching how concrete paving is made. The production machinery holds and obvious fascination, but despite over 40 years of visiting plants and looking at everything from a vibrating table bought off EBay for 2,000 quid to a 20 million Euro purpose-built facility featuring the latest and best of everything, I’m still mesmerised by the concrete products that emerge at the end of the process. I must have seen it a thousand times and more, but it still amazes me that freshly mixed concrete can, in a matter of seconds, emerge from a machine as a firm and cohesive paving unit, capable of maintaining its shape despite being less than a minute old. Last Wednesday, I had the chance to tour the Brett factories at Barrow-on-Soar near Loughborough in Leicestershire. The site has passed through a host of familiar names over the past two decades: Steetley, Redland, LaFarge and now Brett have all, at some time, taken the distinctive pinky-red rock from Europe’s second largest granite quarry at nearby Mountsorrel and turned it into all sorts of concrete products, from ready-mix to Trief kerbs, from garden flagstones to shot-textured commercial paving. The site has seemed to lack direction and purpose for the past decade. It was still churning out product, but with no strong strategy or plan driving it forward. Aggregates went in one gate while blocks, flags and kerbs emerged at the other because that’s what had always happened, but no-one really knew why. Now that Brett have taken up the reins, it does seem to have acquired a long overdue sense of purpose: someone wants this site to manufacture quality products as part of a wider scheme to create a credible force within the hard-landscaping market. 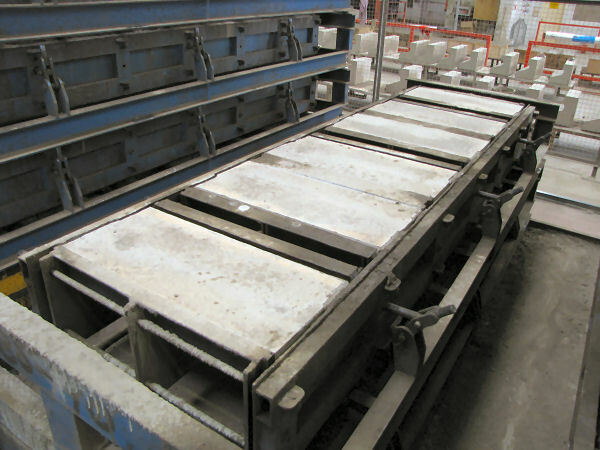 For years, granite has come onto the site via a dedicated conveyor system that runs for 3km from quarry to site, passing over the River Soar and then under the A6 dual carriageway, but as manufacturing technology has improved, the use of granite dust and chippings for block making has decreased, and now most of the granite is transferred to dedicated rail wagons at the LaFarge owned and operated railhead sited on the main London-Nottingham line. 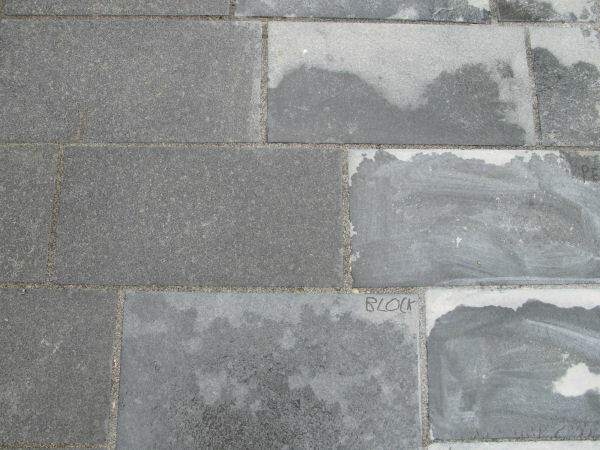 The granite can be unpredictable, darker at some levels of the enormous quarry, and lighter in others, and this variability effects the colouring of concrete products so alternative aggregates now dominate, while the granite is reserved for uncoloured products such as commercial flagstones and the exclusive Trief and Kassel kerbs. 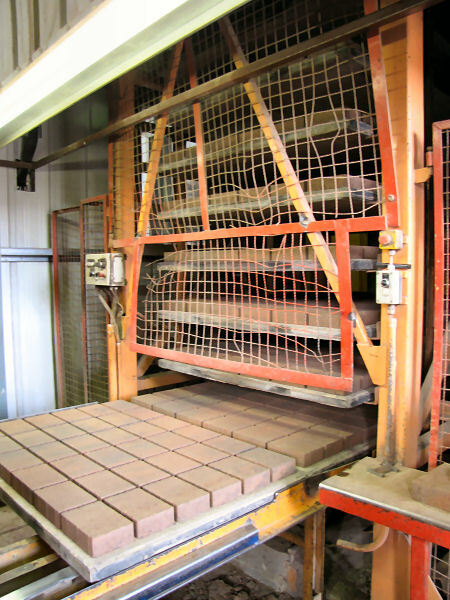 What makes the Barrow plant intensely fascinating is the mix of machinery and technologies. 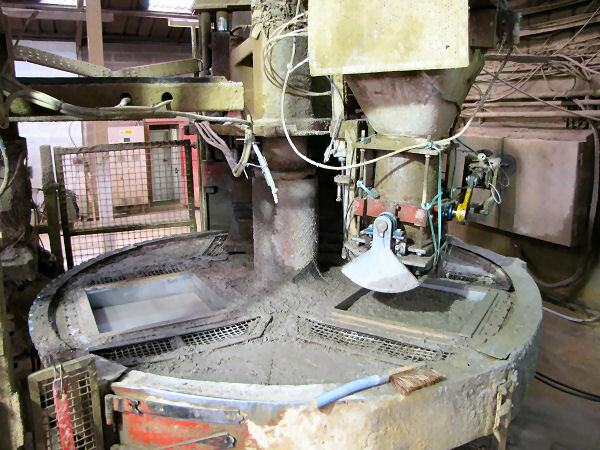 Hand-finished kerb production contrasts with a state-of-the-art block curing unit where high humidity and silica fume helps accelerate curing and minimise efflorescence; BS flag production that is little changed from what I saw a child in the 1960s to highly-controlled shot-texturing. It’s strangely reassuring the see that, other than a change from the traditional paper filters to the modern so-called “Eco-Filters”, the method used to manufacture wet-press concrete flags is virtually unchanged. We’ve put men on the moon, created test-tube babies, invented t’internet, but flags are still made in the same way, because that’s what works best! Some things, however, do move on, and it was a real privilege to be given a sneak preview of a few of the products and innovations that Brett is working on in the top-secret development portacabin. I just wish I could tell you about them, especially the too-damned-clever-by-half p…..but no! All will be revealed in due course. You’ll just have to be patient! There are also exciting developments in the area of potential bargains. Plans are in place to offer aged stock and end-of-line items at discounted prices to interested contractors and DIYers. There’s still a bit of t-crossing and i-dotting to be done, but with a bit of luck and a following wind, there should be an announcement on this site in the very neat future. 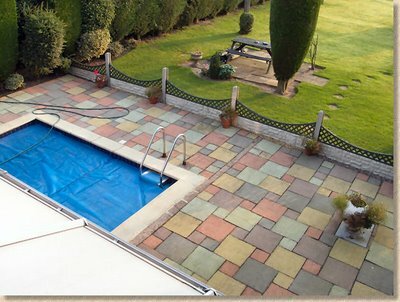 Inspiring, too, to hear of the company’s determination to extend their refreshing range of products northwards, to those parts of the country that haven’t yet had the opportunity to appreciate why so many contractors in the south of England regard Brett as their number one choice for hard-landscaping and residential paving. Landscaping Products MD Chris Droogan reinforced this message of their commitment to contractors and customers with his passionate explanation of how the whole company is focussed on people, and how being a family business at heart, still under the aegis of Bill Brett, ensures they never lose sight of that. I do hope Brett keeps its word to reach those of us in northern England, Wales and Scotland. Diversity and competition drives innovation and improvement, and it’s only by creating a truly diverse and competitive market throughout the country that the industry as a whole is pushed on to bigger and better things. They don't make 'em like this anymore! While at Glee last month I stayed at Highfield Farm, a great B&B just off the M42/M6Toll junction at Curdworth, near Sutton Coldfield. It was late on the Sunday evening when I landed and after the best part of a day traipsing around the NEC, I was knackered and literally fell into the bed without taking any notice of my surroundings. I thought all this old Marley paving had long since been binned, along with flock wallpaper, clackers and Showaddywaddy! 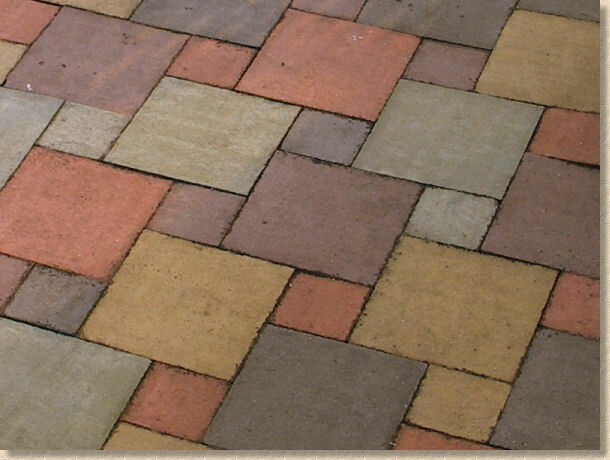 Back in the 1970s, this was the ultimate in patio paving. No fancy exposed aggregates or shot-textures or stone from far-flung corners of the planet, oh no! When you wanted to impress the neighbours with your patio, the only real choice was Marley paving in a range of gaudy colours and three sizes (for some reason, the 2' x 1' size seems to be missing from this pool surround). It is *so* of its time. I showed the picture to Denise O'Gara, now with Natural Paving but formerly marketing maestro at Marley, and we reckon it's possible to work out exactly when this patio was installed. 1973. April, probably the 18th, late in the afternoon! 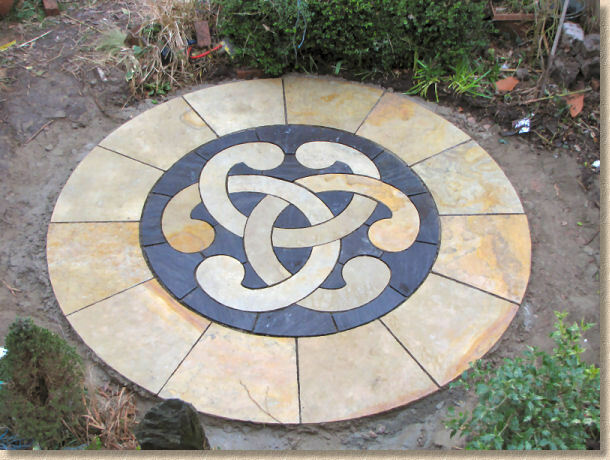 In 35 years time, will we look back at an Indian sandstone patio with feature circle and immediately be transported back to 2008? 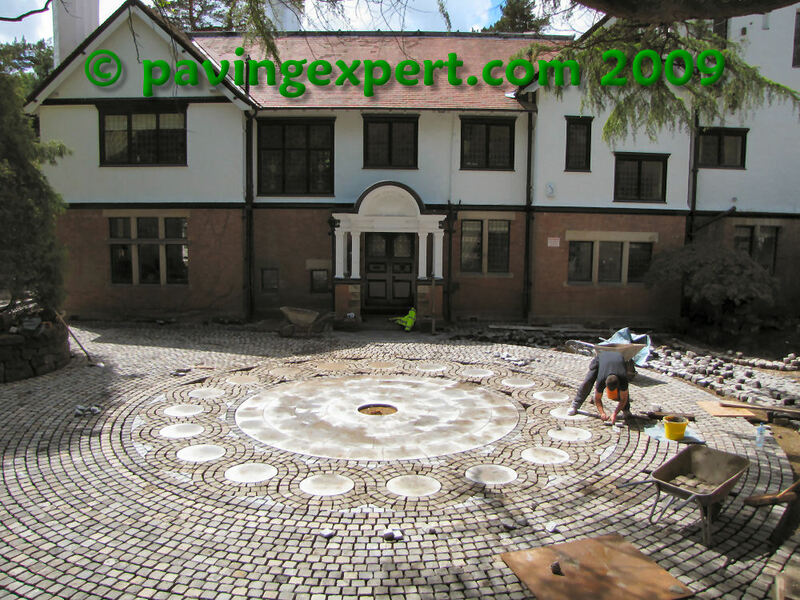 We tend not to be overly precious about historic paving. 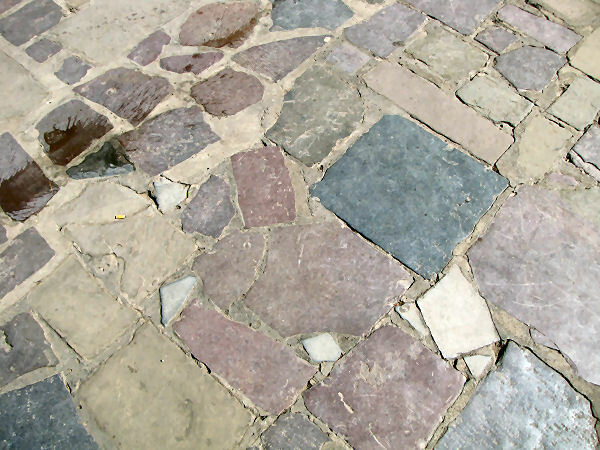 In many towns and cities throughout Britain and Ireland, it’s not all that rare to encounter paving that can be a couple of hundred years old, or even older. 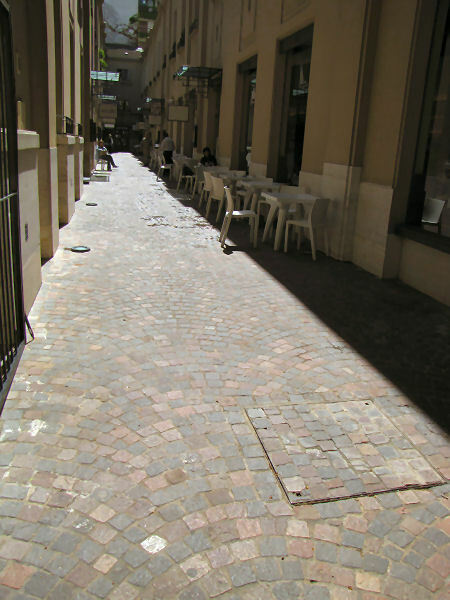 In most cases it will be stone, although there are some 100+ year old clay paver constructions if you know where to look, but all too often the paving has been lifted and re-laid in a truly awful fashion, with modern cement mortar daubed across the joints. Although there are concrete pavings from the 1930s (usually 3 by 2s) aplenty, it’s rare to see patio paving surviving for so long, which, I suppose, is testament to the quality and to the standard of installation. Isn’t there some sort of government scheme to protect historically important constructions? Surely this should qualify as a national monument? Is it really four months since I was last able to post to this blog? It's been a summer of one problem after another, culminating with the complete loss of the whole site for a week at the back end of September, while it was transferred to a new host. That was supposed to be seamless but turned into an utter disaster mostly because the new host failed to appoint a single tech s'port person to oversee the whole move, and so six weeks of meticulous preparation counted for nothing. Whilst researching the move, I came across a number of 'site transfer management experts' who offered to handle the whole move on your behalf. Some were obviously students in a back bedroom, but I was very impressed with a US-based company, Websitemovers who offered excellent technical advice and what now seems like a very good price. After all the grief and stress and sleepless nights myself and my technical guru Ian went through, $200 seems like a right bloody bargain! If I ever have to move a site again, I won't hesitate to hand it over to someone like that. The old hosting company had been a wonderful home for pavingexpert.com over the past decade, but they decided to pursue a business model that focuses on large corporate customers and they could no longer cater for smaller customers. Back in 1997 when all this started, 200Mb of webspace was gi-bloody-normous and I couldn't imagine ever needing more than around a tenth of that. Back then, most of us were on 56k copper-line dial up, so keeping images small and compressed was vital to maintain a reasonable download time. With the widespread uptake of broadband, images have been allowed to expand, in size, quality and number, but even so, it came as a bit of a shock to be told that the site was occupying a rather cumbersome 1800Mb, nine times what was allowed, but it was the bandwidth that most concerned the ex-host. With traffic over the so-called summer peaking at just short of 180,000 unique visitors per month, they wanted me to invest in one of their very expensive and phenomenally large, e-commerce enabled dedicated servers which would have pushed the running costs to well over 10 grand a year, and as the site makes no money but relies entirely on my own pocket money, that just wasn't practical! So: a new host. It's costing more than it did, but not as much it might have done. To date, other than the transfer problems, all seems to be functioning well, the speed and uptime seem very good, and I'm playing around with some new toys that may appear over the winter, not least of which should be the new Brew Cabin discussion forum. For now, it's good to have the blog functioning again. Let's see what goes wrong next! 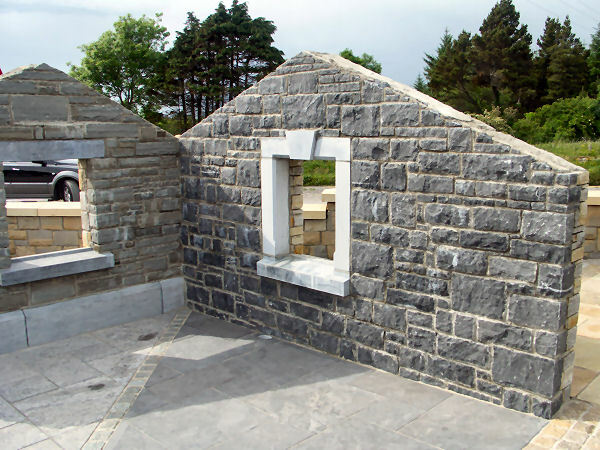 The last few days have been spent back in Ireland, dodging showers and viewing some truly delicious stonework supplied by McMonagle Stone of Mountcharles in Co. Donegal. The real purpose of the journey was to spend a bit of time reviewing their expanding range of stone products and in talking the sales staff through the basics of pavement design, construction and maintenance, but I’ve had five glorious days of travelling the north-west corner of Ireland looking at stone, talking about stone, comparing stone, assessing stone, visiting sites, projects and quarries, meeting designers, contractors and installers, all in the name of “work”. We started off looking at a couple of problems with colour: an over-exuberant oxidation of a Donegal Quartzite that has seen a limited number of pieces develop an allegedly undesirable rusty-brown, which, as far as I could see, is part of the natural weathering of the stone, and the “curse of the black limestone”, where the popular Chinese flagstone is bleached to a very bright grey by the strong summer sunshine. This is a problem affecting all suppliers of this particular imported limestone, and to date, the best cure I’ve seen is to use a Lithofin MN Colour Impregnator to revitalise the natural dark tones and then to ‘fix’ the renewed sombreness using MN Stain Stop. However, the McMonagle clan have been experimenting back at their Mountcharles HQ, using a whole range of different enhancers, impregnators and sealants to restore the jaded limestone and it has to be acknowledged that, of them all, the Romex Colour Enhancer is the new champion, bringing back the brooding hues, without rendering the stone glossy or waxy. As we’ve come to expect with Romex products, availability of this new jollop is limited but with this trial proving just how effective it can be, there’s bound to be a bit of a push to get it out to the ever-growing band of Romex distributors. Down the coast, past the brooding hulk of Ben Bulben, through Sligo and skirting the plains of Mayo to the county Galway, where Moypave are undertaking the high-quality installation of sandstone and granite paving to a rather swanky private residence. I don’t normally comment publicly on contractor’s work but this has to be an exception. The standard is as good as anything I have ever seen, in both Ireland and Britain, and is leagues ahead of most work. Neville and his team deserve enormous credit for their endeavours. The detailed cutting-in around the sandstone heli-pad, the superb fan radius around the water feature and the near-perfect mitring of bay window angles is a joy to behold and an example to us all of just what is possible with a bit of effort. An evening catching up with kith and kin by the grey lake of Loughrea and then back north to Donegal. The weekend turned out to be that rarest of events in that part of the world: dry and sunny. I think it’s the first time I’ve seen Donegal without it being swathed in mist or oppressed by leaden skies and tipping rain, so it was an opportunity not to be wasted. The Dun Na nGall waterbus is a real treat: 90 minutes put-putting around the Bay for a mere 15 Euro, with history, drama, and wildlife in the form of newly born seal pups and a local “Wild Man” all part of the thrill. Sunday was, if you’d believe it, even warmer, sunnier and drier. Three hours travelling through the Blue Stack Mountains to visit quartzite quarries around Gleann Cholm Cille, and one of the party suffered sunburn … yes, sunburn in County Donegal! Quartzite is a hard rock, and a speciality of Donegal. For those not familiar with the material, think of it as a sandstone baked-hard by metamorphic processes. Crushed and heated by the huge tectonic pressures that created the mountains, quartzite is damned hard, but essentially still laminar in nature, making it relatively easy to split into sheets. 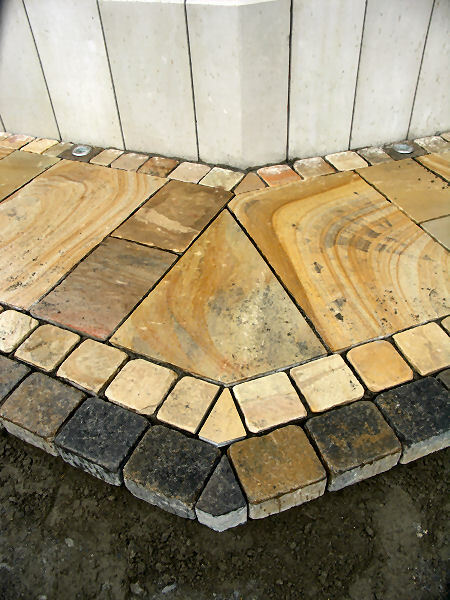 The thicker sheets are guillotined to make walling block, while thinner sheets are trimmed to create flagstones, setts or tiles, or left in random shapes as the renowned quartzite crazy paving. 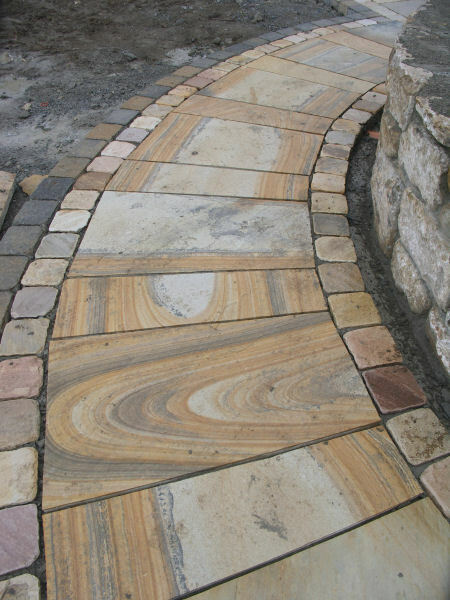 Donegal quartzite occurs in hues of browns, buffs and greys, with a lightly textured surface that glistens in the sun. Where veins of granite have pierced the country rock, nuggets of pyrites (Fool’s Gold) can be found deposited within the hard-as-steel quartzite layers. Conveniently, given the ‘soft’ climate of western Ireland, Donegal quartzite is resistant to weathering and is less prone to colonisation by algae and lichens than is much of the sandstone imported from Asia. 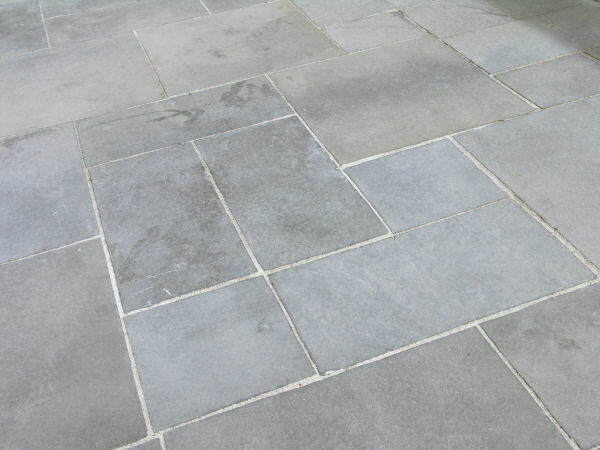 Consequently, it stays cleaner for longer, and retains its colour without fading or bleaching, making it a superb stone for paving, building or hard-landscaping. There’s minimal waste in these quarries: the sheets are selected for the most appropriate use, be it walling, paving or tiling. 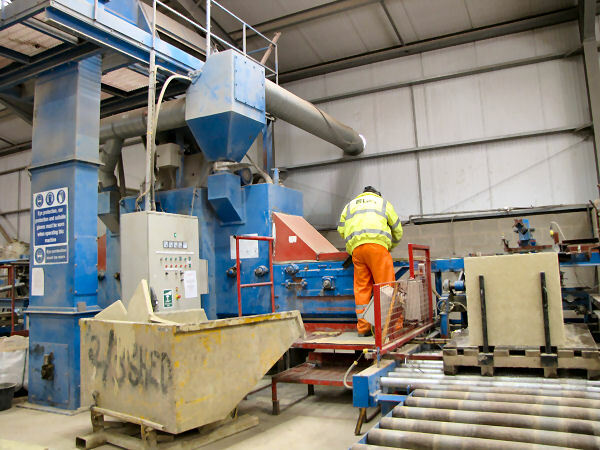 Any offcuts are crushed down to make 20, 14,10 or 6mm chippings, and the finer material is screened to create sands of various grain sizes, from gritty laying course sands to fluffy mortar or jointing sands. 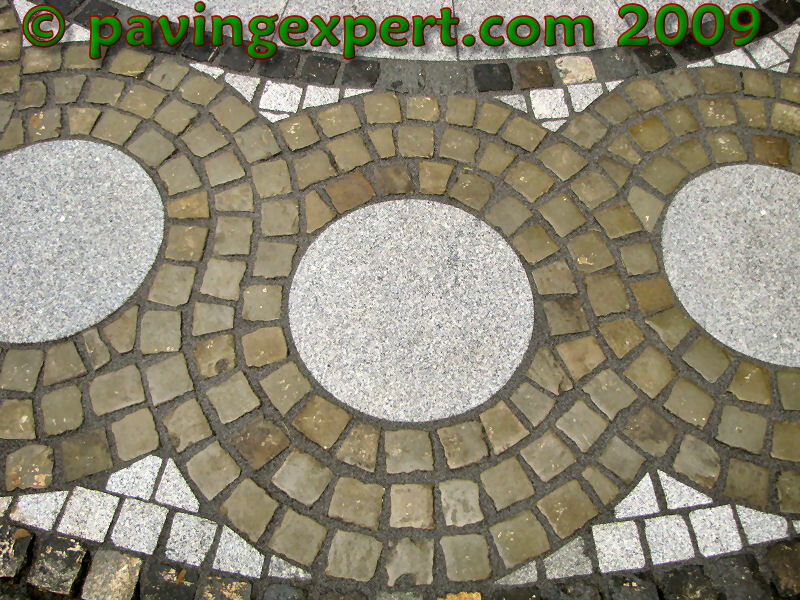 With crazy paving being less fashionable than once it was, the possibility of creating setts is being fully explored. Faces are worked according to what colours are required by customers, with blends incorporating more or less of the browns, buffs and greys mixed to order, but I have to admit that the grey with a dash of buffy-brown would be my first choice. 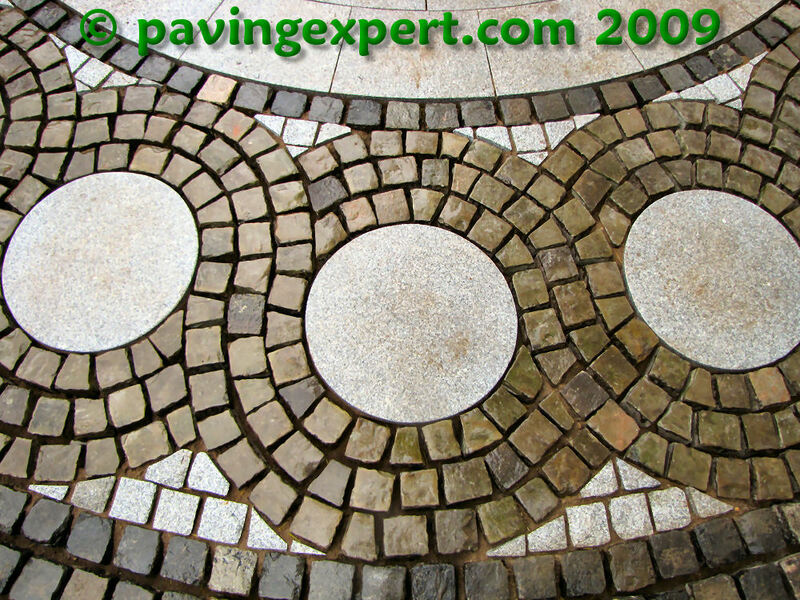 Paving and hard-landscaping displays of exceptional quality have been a feature of the trade in Ireland for far longer than those that have popped up recently in Britain, and even a medium-sized supplier in an out-of-the-way place like Mountcharles can create a stunning showcase for their products. 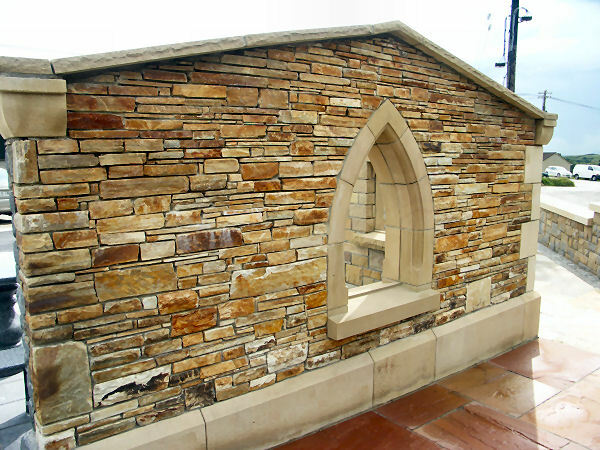 There’s work still to be done at the McMonagle site, but these double-faced walls give just a flavour of the sheer beauty of the stone and the marvellous craftsmanship that is employed in their creation. Well worth a visit if you’re ever fortunate enough to be in that part of the world. 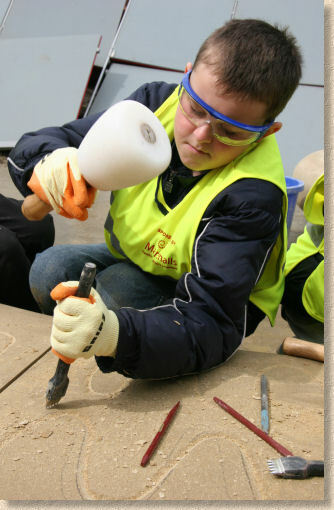 Startling photographic evidence of child labour taking place at one of Marshalls' British sites have been passed to pavingexpert.com. 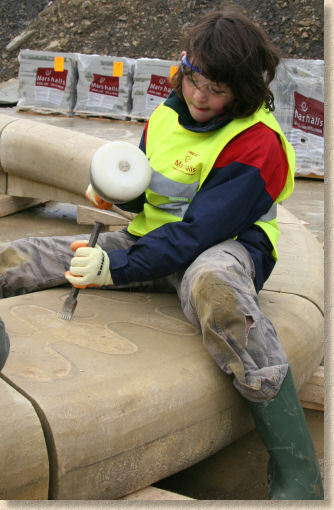 .... to be honest, the child "labour" is completely voluntary and the kids are actually helping to complete a snake of their own design which has been the star attraction at the Chelsea 2008 Flower Show sponsored by Marshalls. Read the full story on the news page of the main website. For the last god-knows how many years, I’ve written a show report on the annual big digger fest that is SED, from back when it was at Fen Farm in Milton Keynes, through the traffic chaos of the first year at Rockingham, and right up to last year’s event. However, having attended this year’s bash yesterday, I spent the best part of an hour wondering what to say. There’s nowt strikingly new, or at least, nowt of immediate interest to the world of paving and hard-landscaping, so what can I say? Plenty of familiar faces: Marshalls seem to have taken over the machine-lay CBP demo on a permanent basis, using their own crew to stage regular displays featuring the versatility of a Robotec laying machine. 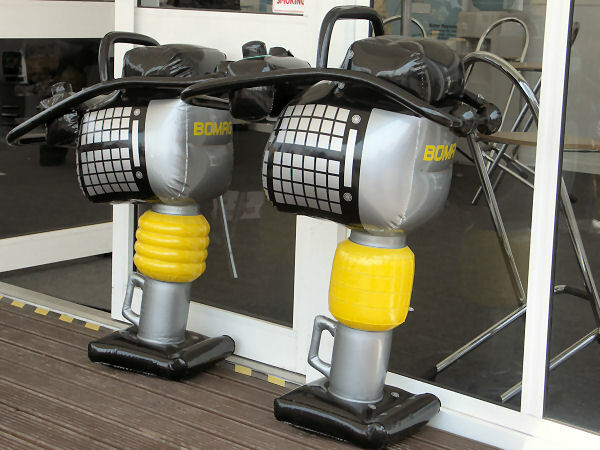 Next door, Probst UK show off the ever-expanding range of lifting heads for machine lay, along with all the other bits and bobs that can make a paver’s life on site that bit easier. The funny-looking ‘flat-tyre’ manual flag-lifter is proving to be incredibly popular, and rightly so. No mechanism to bugger-up; no battery to run flat; nothing to confuse even the most gormless apprentice – the best ideas are always the simple ones. Yes: there were new plate compactors from almost every new manufacturer, and new mixers, roller strikers, rammers, but nothing that would set the pace a-racing, even if I wasn’t on beta blockers. I quite fancy one of the remote control plate compactors, even though they aren’t actually targeted at paving contractors; it’s just the thought of being able to sit in the van, feet up on the dashboard, watching the plate whiz around as if by magic. How long can it be before some boffin comes up with a version based on those robotic hoovers, were a ‘perimeter boundary’ is set up and the plate uses radio signal to self-navigate, covering the entire enclosed area with no need for supervision? And yes: umptillions of big diggers which even now, after forty-odd years of watching them up close, still mesmerise me, even when they’re performing the simplest of tasks. There is something entrancing about watching a hole being dug and then backfilled over and over and over again, something that appeals to our primal nature, and something which the male of the species never seems to out grow. I could be wrong, but I don't think these rammers have much of a wallop to them! Today is the deadline for responses to the comedy proposal from Defra regarding the proposed amendment to s106 of Water Industry Act to remove the right to make connections to existing surface water drains and sewers, and to require all new paving to front gardens to be permeable. As many readers will be aware, this proposal has caused a great deal of concern amongst contractors, some of whom have chosen to vent their spleen in The Brew Cabin. Residential paving contractors have no unified voice to represent their views, so over the past two months, I've been canvassing opinion via email and phone, as well as following the various discussions that have developed in The Brew Cabin and have attempted to summarise the points made and opinions held in a single document which I have just forwarded to Defra for consideration. Anyone wanting to read my submission can download a copy from here. It's a Word document, so should be readily accessible by most, if not all, interested parties. Obviously, this is a story that is bound to unfold over the coming months and I hope to keep up-to-date with what is being said and done, but, up to now, the opinion of the small residential paving contractor, so-called White Van Man, has been missing from the considerations. Indeed, you only have to read the worryingly partial Impact Assessment document to get a feel of how uninformed and naive regarding our trade this project has been to date. I'd welcome thoughts and comments on what I've written in the response document, either here on the blog, in The Brew Cabin, by email or by phone. The more information and opinion from smaller contractors that I have, the better I can present those opinions to the consultation. This proposal directly affects our trade. I can't think of any other industry that would be so blithely ignored when considering legislation that could devastate their livelihood. If we don't speak up and present our case, we can't complain when the politicians, the academics, the Whitehall mandarins and all the usual suits impose THEIR will upon us. The onset of Spring has coincided with a couple of time-consuming projects that has resulted in me working every single day for the past 3 months, with no parole to play in my garden, and no opportunity to update this blog. The mad panic generated by DEFRA's part-baked ideas on mandatory permeable paving has resulted in me spending at least half of every day talking to worried contractors and other interested parties, and simultaneously preparing a response that will be submitted to DEFRA later today. On top of that, the HSE project to require the use of dust suppression when cutting concrete paving units has reached a climax, with the official launch taking place next week. I've been involved in creating a DVD aimed at site workers and while it's been incredibly enjoyable and eminently worthy, it's taken up more time than I anticipated. 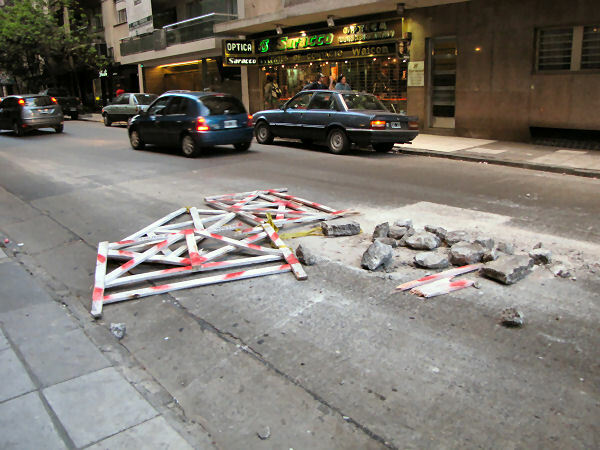 However, a Chilean correspondent has been emailing to tell me about work taking place in Valparaiso, where much of the paving that was originally imported from Liverpool, is now being re-laid. 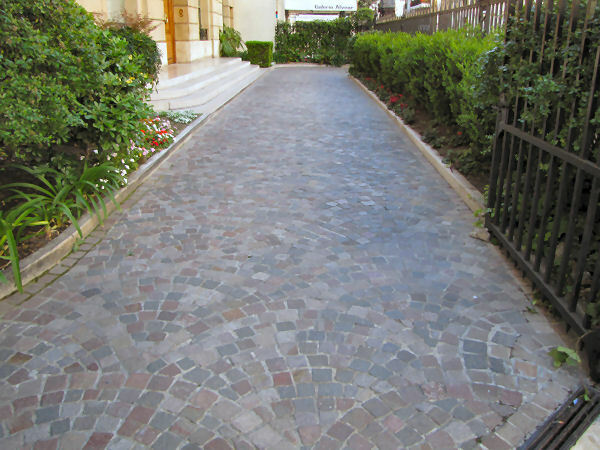 The end of driveways as we know them? 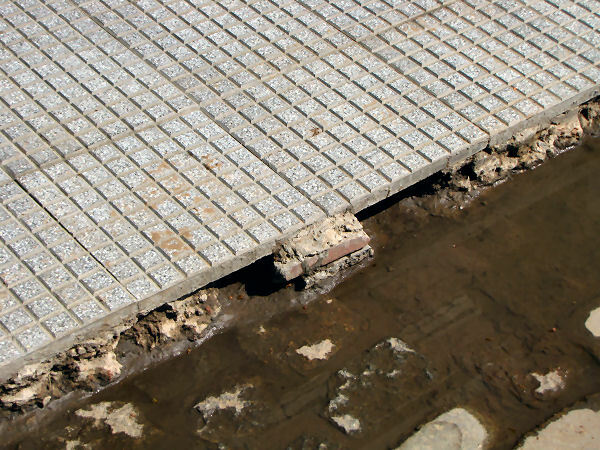 The government published its vision for future surface water management yesterday, and there are a couple of "initiatives" that are going to have a massive impact on the patio and driveways businesses. I picked up on the story in The Guardian this morning, but as that article is pretty non-specific and littered with quotes from peripheral bodies such as the RSPB and the National Trust, but no comment at all from anyone in the paving business or the wider construction industry, I tracked down the DEFRA document and read it for myself. Much of it reads like most other government publications: long on vision and promises, yet short on action and funding, but tucked away on page 59 is the shock news that, in future, the right of householders to create off-road parking for themselves will lose its exemption from planning permission, unless it is a loose material such as gravel, or a permeable block system. Further, the right of householders to make a connection to an existing SW system is likely to be withdrawn. This, in effect, means an end to traditional driveways constructed from block paving, bitmac, concrete, PIC, setts, flags...in fact, it means massive changes to an industry that is virtually unregulated and, for a large part, untrained. Just where does the govt think all these skilled permeable pavement installers will come from? 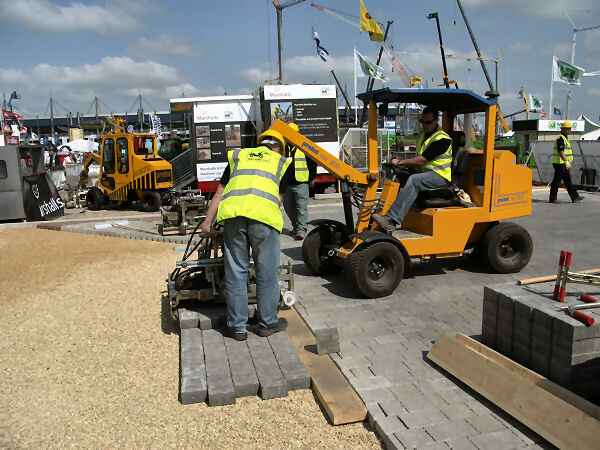 We haven't got enough competent installers to cope with demand for Permeable Concrete Block Paving (PCBP) from the commercial sector, let alone the private, residential market. Without effective training, we face having thousands of ineffective cowboy installations, and poorly installed PCBP can cause far more serious problems than traditional CBPs or even tinker-laid bitmac. Whilst fully agreeing with the aims of this initiative, I have severe reservations regarding its chance of success. The patio and driveway trade has been given a free rein for decades: attempting to impose some semblance of order and regulation will not be an easy task. Those contractors with a degree of integrity will, no doubt, do their best to play by the rules, but I fear those rogues that blight our trade, will manipulate this into yet another way to undercut the honest tradesman. Further, who gets their collar felt when it comes to light that the new driveway Mr & Mrs Smith have just had installed isn't actually permeable/porous? The dodgy contractor will be long gone, his pockets stuffed with ill-gotten pound notes, which leaves the householder facing the wrath of DEFRA and the local council, and, yet again, the paving trade, en masse, will be portrayed as a bunch of money-grabbing, untrustworthy, shonky ne'er-do-wells. Coming up with such a scheme is all well and good, but how will it be implemented, and how will it be policed? Many of the regular site visitors will be aware that I've been involved with a HSE project looking at ways to introduce mandatory dust suppression for cutting all concrete paving materials from the Spring of this year. Basically, from the launch (probably April), it will be "sternly frowned upon" for any paving contractor to use a cut-off saw without dust suppression, which will mean a water-kit being attached. This is not some eejit idea from the HSE imposed on us from on high: they've pulled together a fairly representative committee of "interested parties", which includes meself, Interpave (for the manufacturers), Highways Agency, Daniel Contractors, Civil Engineers Contractors Association, Stihl, Makita, Speedy Hire, Local Govt, Unions and a few others. The aim has been to produce a strategy that will be accepted by the industry rather than summat we'll all resent and ignore. I've been heavily involved in the "training and communications" sub-group, and it's our job to produce the posters, leaflets, videos and whathaveyou. We now have what we think is a reasonable information leaflet and we need feedback from contractors and others in the industry to make sure it gets the message across clearly and succinctly. The leaflet is still "draft" but I've got permission to let it be viewed by interested parties to obtain their feedback. Anyone willing to review the very short leaflet and let us have their thoughts should email me at the usual address (tony AT name-of-website) and I'll send you a link. Comments required by Jan 17th (a week tomorrow), please. 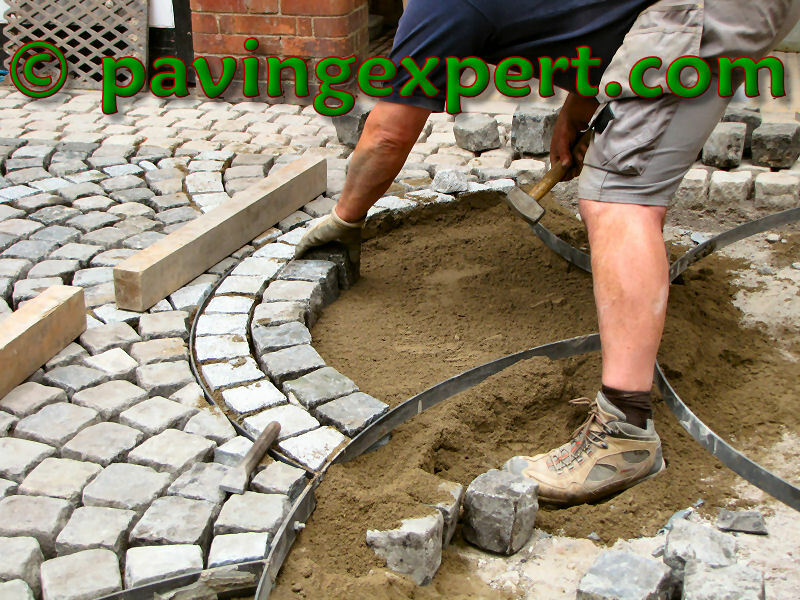 I'm sure some readers of this site wonder if, at times, my attitude to the laying of paving is a bit too "belt and braces", and that my insistence on using the best materials in the correct manner can occasionally be a bit OTT. I usually defend my position with something along the lines of, "If a job's worth doing....". So: imagine you'd laid a bit of paving on a job and it turned out that you'd inadvertently used the wrong sand. Instead of playing by the rules and using a proper grit/sharp/coarse sand, you thought you'd use a bit of local sand that was going cheap, and was being promoted as eco-friendly recycling of an otherwise waste material. How much do you reckon it would cost to replace said cheap sand when the paving started wobbling and settling and shifting and tripping-up folks? A couple of quid per square metre? That would cover the replacement sand, surely, but what about the labour of lifting and re-laying? Perhaps twenty quid? Thirty? How about a whopping 160 quid per metre? That's the figure quoted in this BBC News report regrading the cost to replace the wrong sand used to lay the paving in the centre of Falmouth in 2001. One hundred and sixty frigging quid per square metre for the wrong sand! The poll tax payers of ancient Kernow are to stump up £160,000 to lift and re-lay a mere 1,000m² of paving. I reckon someone, somewhere, is feeling a little bit reluctant to admit that the few pence per square metre they saved by bringing in some cheap sand is now costing the public about the same as a whole new pavement. Thanks to long-time site reader Jon R from Chesterfield for bringing this to my attention. Good to hear from you again, Jon! Mrs Taz and meself celebrated (if that’s the right word) our silver wedding this week. It’s hard to believe we’ve been lumbered with each other for 25 years (plus another 4 years of on-and-off courting) but at least our mutual betrothal has prevented two innocent parties from having their lives ruined. Mrs Taz broke her leg a couple of months back, and the enforced rest has enabled her to devote even more time to monitoring the output of the National Geographic and Discovery channels, and particularly the near-perpetual cycle of documentaries concerning the so-called “Boy King”, one of which seems to be on the screen every time I pass through the lounge. So, what could be more appropriate than a visit to the Tutankhamun exhibition currently holding court at the Minnellium Dome in that London? I reluctantly agreed to take time off my vital work, and promised not to talk about paving, nor to take any photos of paving, nor to have the craic with any streetworks gangs at any time while away in that London, but to devote myself to alleged cultural activities, namely King Tut, a big dinner, an evening at the theatre, and the wanton pillaging of my wallet whilst being dragged kicking and screaming along Bond Street. King Tut? What an anti-climax! What’s the one bit of kit that anyone over the age of three associates with the lad? That big golden head-piece yoke, of course, and that’s the one item that’s missing. They have its picture on the glossy carrier bags, and on the tickets. It’s even on the website (see for yourself), but the thing is not at the exhibition, and that, for me, is a major disappointment. Is this not a blatant breach of advertising standards? Are they allowed to promote the event by portraying an item that doesn’t actually appear in the exhibition? I wasted the best part of three hours wandering through an overgrown tent looking at all sorts of tat from ancient Egypt and a handful of items that actually had a direct connection to the man himself, but no big gold mask. What they did have, though, was the most exorbitantly priced and grossly exploitative “gift shop” it’s ever been my misfortune to visit. It’s located at the end of the tour, between the final gallery and the exit, so there’s no option but to pass through as you fight your way between the throngs of unimpressed primary school groups that are desperately seeking some souvenir they can buy with the fiver begrudgingly pressed into their hand by an emotionally-blackmailed parent that morning. I know that these ‘souvenir shops’ are an essential economic strand of these events and that they help ensure the financial success of many an exhibition, but to charge 5p short of nine quid for a tacky plastic keyring, or ten quid for a glass bauble that’s on sale in Poundland for a tenth of that price is nothing short of daylight robbery, and exploitative daylight robbery, at that. 15 quid for a baseball cap! 7 quid for a coloured cardboard replica of the missing head piece!! I was appalled, and listening to the comments of other visitors, they too felt it was a rip off. The show organisers point out that “a percentage” of the funds conned from their captive audience will support important archaeological research in Egypt, and I, along with thousands of others, would normally have no problem with that. I’d gladly put a fiver or a tenner into a collection box if that donation was all to be used for further research, but I abhor the sense of being duped, of being treated as some sort of mug that doesn’t even have the nous to realise he’s being royally screwed. If it wasn’t for the fact that Mrs Taz desperately wanted a souvenir, I would have left buying nothing and felt better for it, but, not wishing to destroy a quarter century of relatively peaceful co-habitation, I agreed to the purchase of a post card for 60p. If they hadn’t been so greedy and contemptuous of their customers, I’d probably have spent more. PS – there’s some poorly laid Turkish travertine flagstones on the floor in one or two of the galleries, but don’t tell Mrs Taz that I noticed it! It's over a week ago now, but this is the first chance I've had to get something online. I spent last Thursday and Friday down at Probst UK main depot in Wem watching a trial installation of Blockleys' clay pavers. You can read all about that on the news page, but while I was there I had my first real chance to play with the battery-powered block splitter which I saw at SED way back in the spring. It's a bit of a beast, and, as one of my contractor chums commented, the offcuts flying out at the speed of a bullet are bound to attract the attention of the Elfin Safety Officer on site, but is this the future for those bone-idle block layers who find the effort of pulling a level just too much of a strain? If you're interested in one, expect to fork out around two-and-a-half grand, but then it is a Probst, so you know it's just about as good as it gets and it won't let you down. I spent Monday down at Aco Towers near Hitchin, photographing the installation of their latest linear channel, a lightweight but incredibly tough PP unit capable of withstanding a 25 tonne load. This is the latest chapter in an ongoing project to create comprehensive installation guides for various Aco products. The Drive Drain Garage Pack was done back during the so-called summer, and now we're looking at Hex Drain and Brickslot. Anticipating an early start on Monday morning, I drove down on Sunday evening and spent the night at a weird motel a few miles from the site, and it was during the 190+ mile jaunt along the nation's motorway network that I detected an almost ever-present whiff of chips. It used to be that the smell of re-fried chips meant you were within 5 miles of Blackpool, an essential skill when judging how much longer you'd be stuck on the coach before achieving blessed freedom at Talbot Road coach depot. However, with the growing use of what is referred to as "Bio-Diesel" amongst the 4x4-driving fraternity, every motorway journey now reeks of burning chip fat, and not even good quality lard, but cheap vegetable oil that makes for inferior chips but, allegedly, works well as an alternative fuel. But the future for chip-fat fueled motoring may not be as rosy as first seems. Given the drive (no pun intended) against obesity, it can only be a matter of time before chips and other deep-fried delicacies are banished and this relatively new source of cheap fuel is lost to humanity. What then? Will the Land Rover be re-named as the Lard Rover? Will the middle classes power their X5s with Extra Virgin Olive Oil? Will my L200 run on the residue of my once-a-month Sunday fry-up? Where do these clowns come from?? Another in the occasional series of heart-stopping questions that come in to the website. In this case, I can't really blame the questioner as he isn't familiar with building technology, but this so-called builder? Well, he should be strung-up by his danglies! "Had some flags done Easter 2007, big puddles, bloke had to redo a big section, now he has half covered the airbricks that are below my patio doors leading into a wooden floored room. He now claims he will move the airbricks up....I am concerned, can you advise?" Advise? I can only advise that this clown is reported to Trading Standards before he wrecks your house! I've finally finished the page on stepping stones, a project first started back in 1999 according to my notes. Eight years: so much for instant publishing on the web, eh? It started as a rough outline, then I had a heart attack and it got stuck in a "I'll finish this one day" folder, which has since been carried forward to two successor computers without ever actually being finished. It was a post in The Brew Cabin earlier this week that prompted me to finally complete the drawings and get the thing done, once and for all. Only another 73 partially-complete pages left in that folder, now! By 'eck! It seems the meejah really have got it in for the hard-landscaping industry. Hot on the heels of an ongoing "investigation" of ethical issues in the importation of stone for paving and walling, the gunsights are being re-targeted, and it's the cement and concrete industry that's in the firing line this time. Friday's Guardian carried a full-page piece about the carbon-bootprint of cement manufacturing, and while there is valid cause for concern, there's no indication of how the environmental impact of cement can be reduced. The article makes reference to the "hard time" that's been given to the aviation industry over CO2 emissions, and hints that the same sort of rough ride might be on the cards for the cement trade, but fails to acknowledge that, while trips to Prague and Riga for stag weekends are a luxury that we could manage without (Blackpool isn't all that bad for pre-nuptual shenanigans! ), the prospect of us going back to wattle and daub is much more fanciful. Yes: cement manufacture churns out millions of tonnes of CO2 and consumes vast quantities of energy, but what's the alternative? Marshalls have been working to reduce their total carbon emission from block production, while Charcon have signed up to the Carbon Trust, and I know that most, if not all, Western cement manufacturers look at how they can maximise the quantity of cement produced for the minimum energy input, if only for economic rather than environmental reasons. All life has an impact on the environment. We're all part of the environment and even the act of breathing emits carbon dioxide. It's impossible to exist without affecting the environment. Some activities can be portrayed as exorbitant and unsustainable; construction is vital and one of the activities that makes us human. As the Builder and Engineer awards on Wednesday night sought to emphasise, the construction industry is beginning to re-assess its environmental impact and develop working methods and materials that minimise any deleterious effect, but we will never reach a point where construction, or humanity, has zero impact. If we do, it means we've become extinct! My missus didn't recognise me with my clothes on! I’m not the sort of bloke that’s comfortable in a suit. Weddings, funerals and the occasional exceptionally important business meeting are the only reasons for surrendering my usual outfit of casual shirt and jeans. So the odds on me dressing in what is referred to as “Evening Wear” in educated circles and a “Penguin Suit” by the son and heir would normally be slightly more generous than those offered on Nessie to be seen riding a Harley Davidson down the M6 with Elvis riding pillion and Lord Lucan in the sidecar. 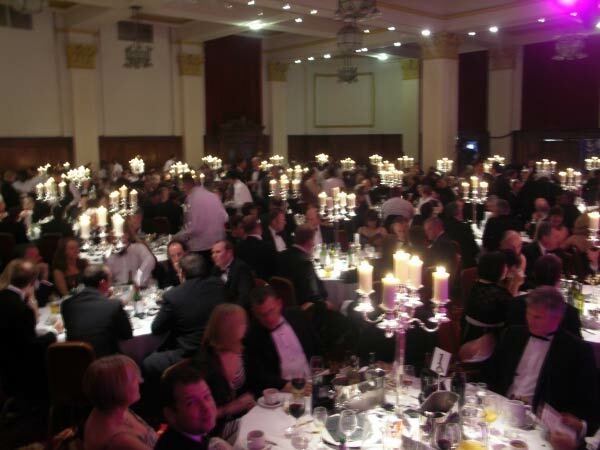 However, one of the better annual award events has a “Black Tie” policy, which doesn’t actually mean “wear a tie that is black”, but “wear the most uncomfortable shirt you can find and with it a bow-shaped noose that constricts the throat”, so, if you want to take part in the fun and games, you have to wear the comedy outfit. All of which explains why, on Wednesday night, an awkward, discomposed and self-conscious-looking ex-contractor could be seen lurking outside Manchester’s resplendent Palace Hotel, waiting for his generous hosts from Charcon to find their way to the big city so that they might confer the award for “Public Project of the Year” on a worthy recipient. The Builder and Engineer awards recognise achievement in the commercial and public sector, and the focus this year was very much on wider environmental concerns and carbon footprints in particular. A total of 14 awards are doled out, offering varying degrees of interest to someone from a civils/hard-landscaping background, from almost-none to quite-a-lot. The full list of categories, nominees and eventual winners can be found on the Builder and Engineer website, but a couple are worth mentioning. The Charcon award (or Char-sonne, if you prefer the MC Mike Shaft pronunciation) for Public Project of the Year went to Birse Civils for the A58 Blackbrook by-pass on the outskirts of St. Helens, notable because a colleague of mine was involved in some of the kerb-laying and also for being the source of the JCB that unwittingly led my Father’s funeral cortege along the East Lancs Road last December, an incident that would have amused him greatly. Civils Contractor of the year went to Alfred McAlpine in recognition of their work on widening the M60 Manchester orbital car park with a enviable record of having two periods covering in excess of 1 million man hours without a single notifiable accident, which, when you consider we’re talking about groundworkers, navvies, digger-drivers and blacktop gangs, is nothing short of a miracle. Product of the year, for the second year running, overlooked a bloody clever idea from Advanced Sewer Products and went instead to some scaffolding/formwork gizmo. If you have any involvement at all with sewers or drains, I urge you to take a look at the CamStopper and CamPole products, because they will make your working life safer and easier. Some interesting gossip, as there always is at these events. Charcon marketing boss, the ever-genial Fraser Higgins, let me have one of the first copies of the new SUDS design manual, which I’m planning to review in more detail over the next few days. At first glance, it’s very, very impressive and is certain to become the design manual by which the others are judged. Watch the News pages for the review towards the back end of next week. The tame CBP makers at Charcon have come up with what might be considered a spiffing wheeze. I was shown a new block a couple of weeks back, on condition that I swore a solemn vow to keep me trap shut. However, I’m fairly confident that I won’t be shot at dawn for revealing that it’s damned clever and very, very attractive. In fact, I’d go as far as saying that it’s the best new CBP I’ve seen in 4 years. 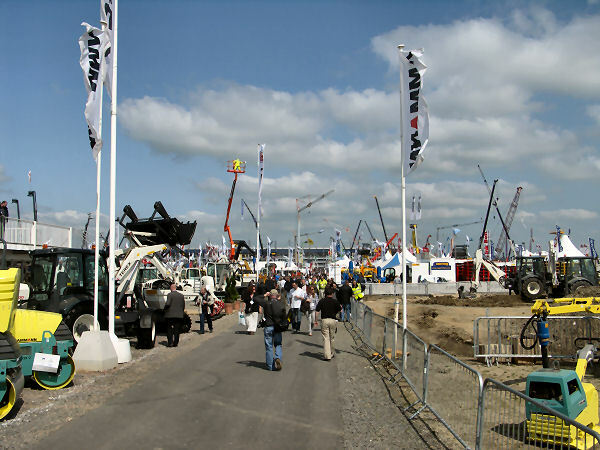 Latest news is that development is ploughing ahead at full speed and trial sites are being sought. 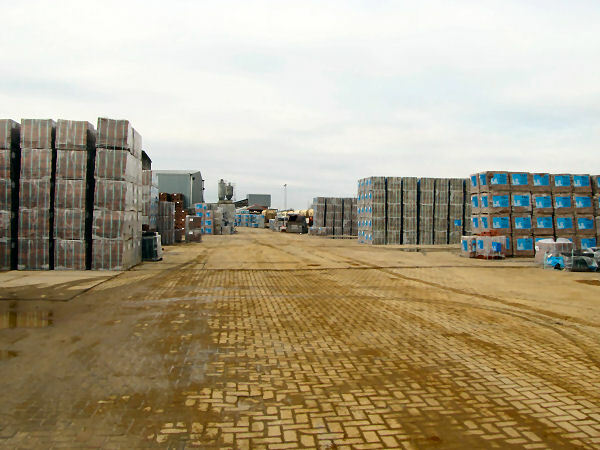 If you have a 100-300m2 commercial/retail/housing site ready to be paved in the next month or so, and would like to be considered as a trial, drop me an email with details of the project and I’ll pass it on to the Charcon block boffins. Also some surprising news from the Bradstone camp, but I’m not sure whether it’s embargoed, so I’ll say nowt until I’m told otherwise. Suffice to say it’s a disappointment, but I can understand the reasoning…sort of. Thankfully, the rather disturbing photos of yours truly in a penguin outfit are not fit for publication, so you’re spared that horror, but I’d like to thank Fraser and everyone at Charcon for inviting me to enjoy their munificent hospitality, to offer sincere congratulations to the award winners, and thank my lucky stars that I didn’t win the Chubby Brown tickets in the “Good Cause” raffle (which raised in excess of three grand for the chosen charity, Caudwell Children). The pleated shirt and bow-tie can now go back into hibernation…or I could put them on EBay, I suppose! We all know that us contractors are the hardest working people on the planet, and, unlike those wimpy desk-pilots tucked up safe, dry and warm in their centrally-heated, air-conditioned carpeted offices, we never skive off or "swing the lead" when there's work to be done. To avoid bouts of apathy-induced unconsciousness, those office-bound inmates are prone to suspending their vital paper-shuffling and they waste time on t'internet instead, the blackguards. They even have a word for it: Monging. Monging is what they do because they're bored with re-arranging their pen collection, and fantasising about the exciting and fun-packed life of your typical navvy is driving them insane with jealousy. Monging is not summat that would normally be associated with us titans of the building trade: we've better things to do, such as holes to dig, flags to lay, and clients to belittle. But, on occasion, it has been known for the comedy weather that torments these islands to get the better of even the best of us, and so we need to take shelter, take refuge, and take a pint or two. For those who find themselves in this nightmarish predicament, may I offer an amusing distraction? I chanced upon this while cleaning-up the trail of gynaecological websites the son and heir had left behind in my browser's history window, and while possibly not as stimulating as some of the other sites, it is safe for use in mixed company, and, more to the point, it's bloody good fun. Simple premise: you are the driver of a typical contractor's vehicle and have to get to the far end of what looks like it was a decent field until the O&K 23 tonner started tracking across it. The vehicle looks not unlike a L200 or a Navarra, but you can pretend it's a 5 Tonne dumper if you think it will help. Remember: no monging - this is only for those rare times when you're rained off or the wagon from Travis Bloody Perkins has failed to turn up at the appointed time yet again.